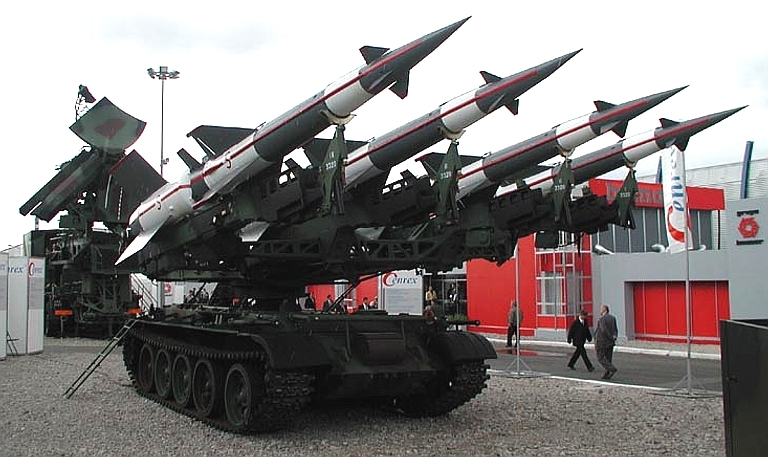 Air Defence Weapons were one of the primary exports of the Soviet Union and Warsaw Pact during the Cold War era. They were supplied as often as commercial products to well moneyed nations unfriendly to the West, as they were supplied as subsidised military aid to developing nations and Soviet satellite nations. Vast quantities of the S-75 Dvina / SA-2 Guideline, S-125 / SA-3 Goa, 2K12 Kub/Kvadrat / SA-6 Gainful, 9K33 Romb/Osa / SA-8 Gecko and 9K31 Strela 1 / SA-9 Gaskin were manufactured and exported. When the Soviet Empire collapsed at the end of the Cold War, the global inventory of former Soviet SAM systems, and associated radars and support equipment, became an important source of revenue vital to the survival of the enormous military-industrial complex spread across former Soviet Republics and former Warsaw Pact nations. Both manufacturers and overhaul depots competed for business in providing spare parts, as well as radar, missile and equipment repairs and overhauls. 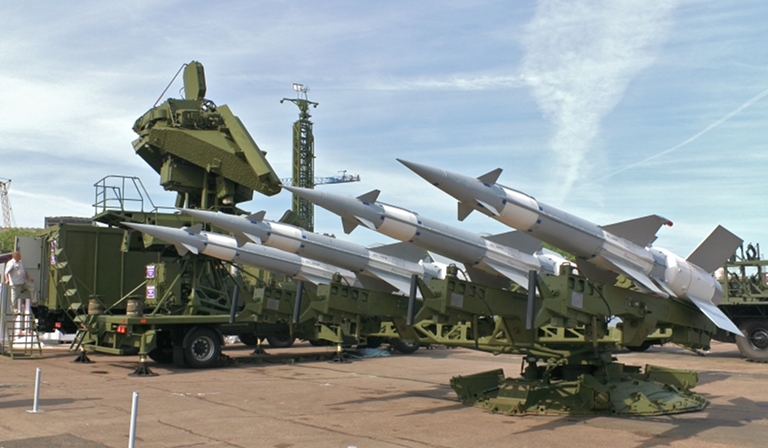 The massive drawdown of the former Soviet and Warsaw Pact military machine also produced a surplus of equipment and warehoused warstocks of missiles and spare parts, much of which appeared on the global arms market at often bargain basement prices. A decade after the Cold War, technology insertion programmes and upgrades began to appear in the market. There were partly driven by market demands for better capabilities in their air defence systems, but also partly driven by increasing difficulties in manufacturing obsolete technologies in a dramatically downsized industrial base. A prominent feature of many upgrades has been the complete replacement of hardwired analogue electronics with new digital software based equipment, using COTS technology from the global marketplace. 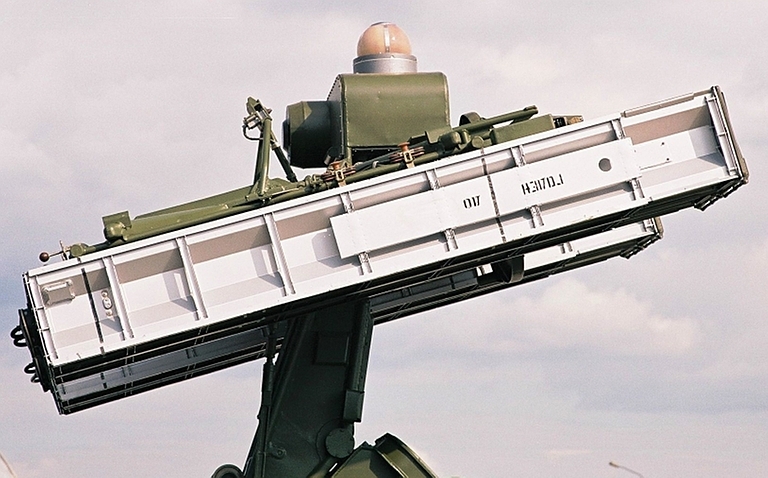 Two decades after the Cold War, the upgrade business is booming, and presents a major competitor to sales of new build air defence systems. 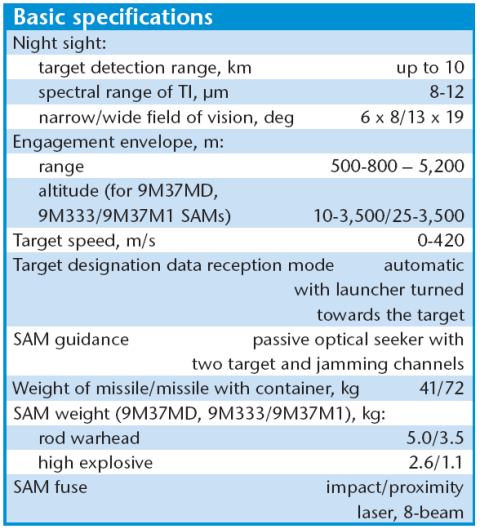 This should not be surprising, as a survey of disclosed sales of the S-300PMU / SA-20 Gargoyle series SAM system puts the cost per battery at US$100 million to US$200 million, depending on configuration and reload stock quantities ordered. For many users the additional lethality and coverage footprint of new generation SAMs like the S-300PMU1/2 and S-300VM becomes less attractive given the price tag, and they opt for upgrades to often substantial existing national investments in Soviet era air defence hardware. 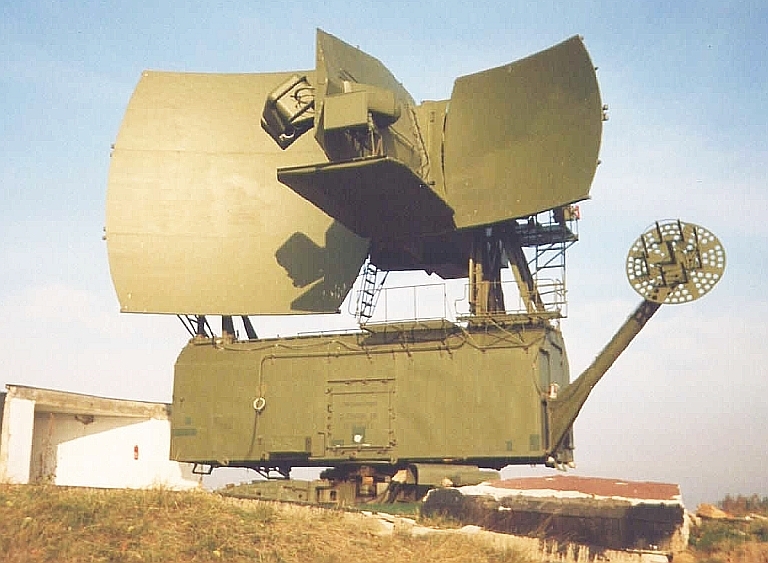 In terms of direct upgrades to legacy systems, the most prominent have been the various packages developed for the semi-mobile S-125 Pechora/Neva / SA-3 Goa and its SNR-125 Low Blow engagement radar. 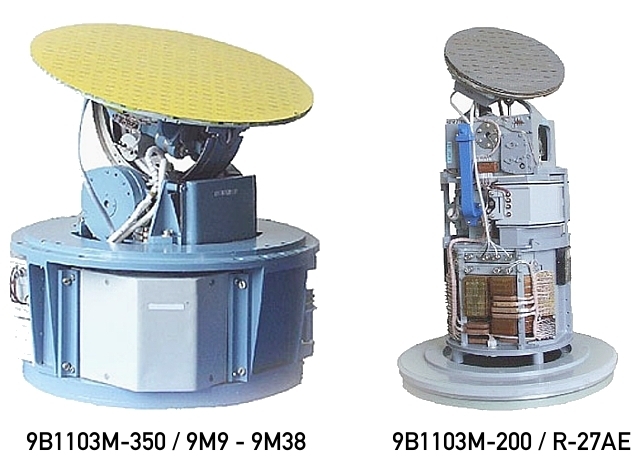 Upgrades are also available for the S-200 Angara/Vega/Dubna / SA-5 Gammon and its 5N62 Square Pair engagement radar, as well as the 2K12 Kub/Kvadrat / SA-6 Gainful, the 9K33 Romb/Osa / SA-8 Gecko, and the 9K35 Strela 10 / SA-13 Gopher. These upgrades parallel a very similar trend observed in widely deployed legacy Soviet era early warning, search and acquisition radars. Upgrade packages are on offer for the P-14 Tall King, P-15 Flat Face, P-18 Spoon Rest, and P-35/37 Big Bar / Big Mesh / Bar Lock series. The more sophisticated upgrades increase the capability of these systems, with many examples increasing radar performance, jam resistance and track capabilities, and some examples improving either mobility of the system, or the kinematic range of the missiles. From a Western perspective, the global proliferation of upgrades presents new and often difficult challenges. 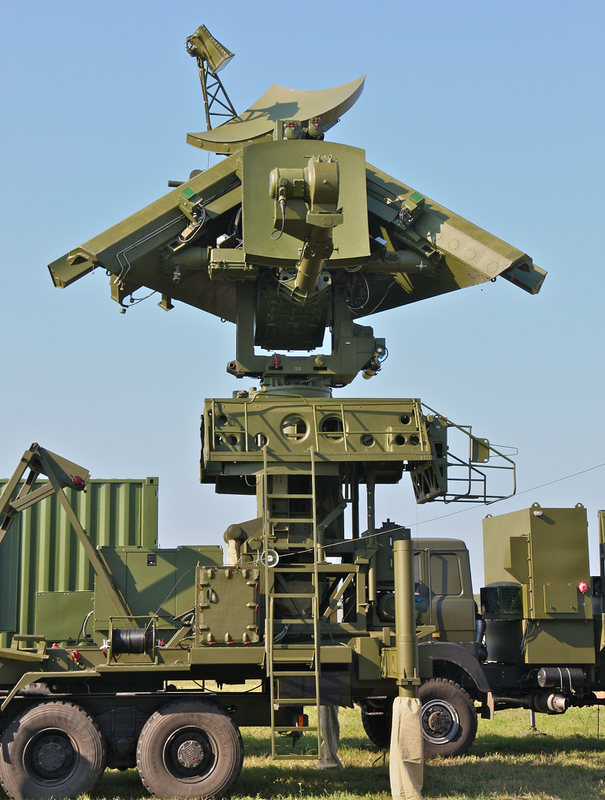 Western nations have an enormous material and intellectual investment in electronic warfare equipment, and emitter databases, crafted around the idiosyncrasies of legacy Soviet era SAM system and radar designs. Replacement of the original electronics with new digital technology will more than often instantly obsolete much of this investment. Jamming techniques which may have been effective against an SNR-125 Low Blow emitting a narrowband carrier with manual channel selection are apt to be entirely ineffective against a digital rebuild of the same radar using automatic wideband pseudorandom frequency hopping and digital signal and data processing. Class 1 Upgrades will involve the replacement of Soviet era electronic, electrical, electro-explosive and mechanical components which are obsoleted and no longer supportable, with current production equivalents. Such upgrades retain the capabilities and limitations of the original design, but extend its service life over the effective service life of the new components. 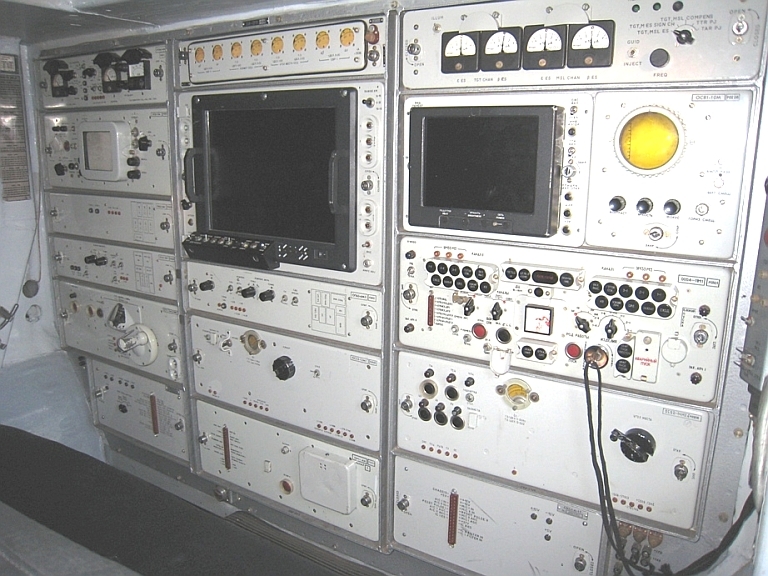 Class 2 Upgrades will involve the replacement of Soviet era electronic, electrical, electro-explosive and mechanical components which are obsoleted and no longer supportable, with current production equivalents, plus the replacement of key functional components such as radar receivers, transmitters, signal processors and data processors with modern digital equivalents. Such upgrades expand the capabilities and performance of the system, and more than often impact key EW parameters such as jam resistance, and radar detection range. As the original antennas and scan formats are retained, the design may still retain many of the electronic vulnerabilities of the original. Class 3 Upgrades are mobility enhancements of Class 1 or 2 upgrades, where the launchers and often engagement radars are rehosted on new trailers, or rebuilt as fully self propelled units on new built chassis. Such upgrades alter the fundamental regime of deployment and vastly enhance survivability, especially where the mobility upgrade replaces cables with digital radio datalinks, and digital automation shortens deployment and stow times for the system, or the missile battery as a whole. 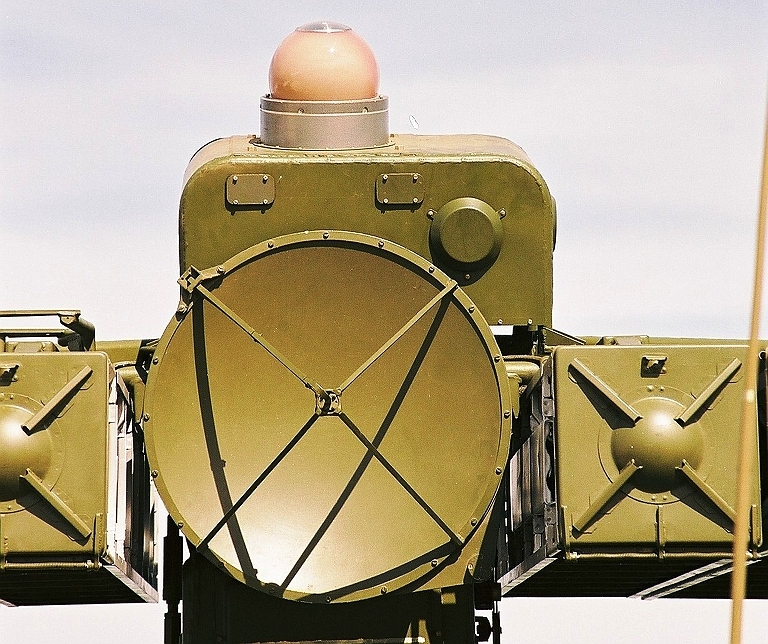 Class 4 Upgrades involved hybridisation, where an entirely new engagement radar, and often new acquisition radar, is introduced to fully supplant the legacy Soviet era radars characteristic of the weapon system. A Class 4 upgrade may be performed in parallel with a Class 1, 2 or 3 upgrade on the remaining system components. Hybridisation will present a major issue in coming years, exacerbating challenges in defeating digital variants of Soviet era systems. A sophisticated long range phased array engagement radar such as the 30N6E2 Tomb Stone or 92N2E Grave Stone when mated with a legacy missile system such as the SA-2, SA-3, SA-5 or SA-6 completely transforms the capabilities of the legacy system. While the legacy missile round might be a stone axe by contemporary standards, it becomes a stone axe hurled with high precision by a highly survivable and jam resistant state-of-the-art sensor system. In a sense, this development emulates the long established Western practice of mating smart digital seekers to legacy unguided munitions to transform their capabilities. The availability of modern active radar seekers for legacy SAM rounds in the 2K12 Kub/Kvadrat / SA-6 Gainful system in fact directly follows the Western technology insertion pattern, with similar transformational impact. Upgrades to legacy air defence weapons are changing the air power game, as the Russians learned in Georgia during their 2008 adventure. A good number of Russian aircraft were shot down by Georgian SAM batteries, as their electronic countermeasures proved ineffective. What the Russians confronted in Georgia were legacy systems covertly upgraded with new hardware by Ukrainian defence contractors, active players in the global upgrade market. The Russian experience in Georgia is a lesson which remains to be understood by Western defence bureaucracies. Most of the known upgrades to legacy SAM systems involve replacement of analogue engagement radar, and often supporting acquisition radar, modules and components with modern technology COTS based digital replacements. Often thermionic technology transmitters and receivers are replaced with modern solid state components. This in itself typically provides significant gains in jam resistance, clutter rejection and detection range [sensitivity] for low signature targets. 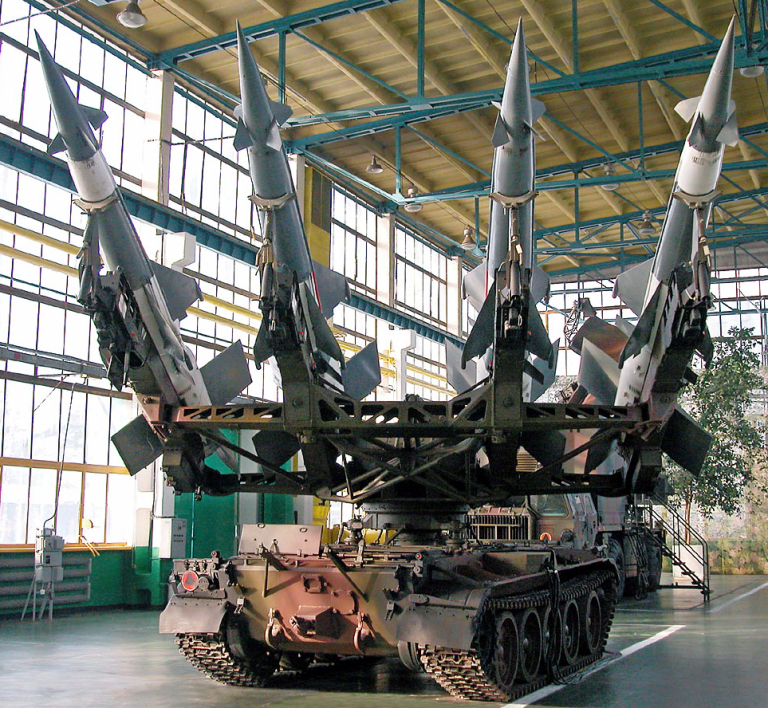 Moreover, improved clutter rejection typically improves tracking capability against low altitude targets, a particular weakness of most Cold War era Soviet designs. Improved control laws in command link guided weapons have also produced significant range envelope improvements. To date seeker retrofits have been less common. This is for several reasons. The first and foremost is that most upgrades to date have been performed on SA-2 and SA-3 systems which are command link systems without terminal homing seekers, and the desire was to permit reuse of existing warstocks of missile rounds. The second reason has been cost, as a digital upgrade to an engagement radar incurs costs only against a small number of such devices, compared to hundreds or thousands of missile rounds in warstock. The additional operational flexibility and lethality gained has evidently been considered less important. 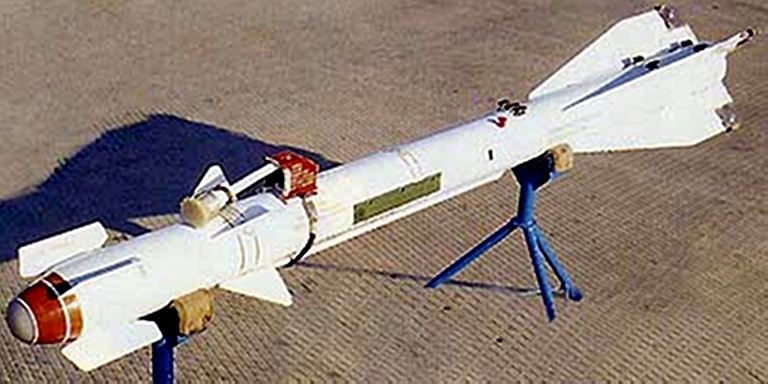 The Iraqi program to retrofit the R-60 Aphid infrared seeker to the 3M9 / SA-6 missile resulted from a very different imperative, which was lethality in an intensive countermeasures environment. The 3M9/9M9 missile has also been the target of Agat's seeker upgrade effort, with similar objectives to the Iraqi effort. The 3M9/9M9 is an attractive candidate for retrofits, not only due to its wide installed base, but also because integration of a replacement for the existing 1SB4 semi-active homing seeker is a straightforward if not minimal effort. An adaptor must be produced to provide signal outputs which emulate those produced by the 1SB4, and inputs to the 1SB4 from the autopilot, and a power supply adaptor is required to condition the power supply intended for the 1SB4 to the new seeker. Only if the new seeker drew significantly more power would it be necessary to replace the existing missile internal power supply. A more sophisticated replacement seeker design would contain an embedded modern FOG or RLG inertial module, possibly a GPS/Glonass receiver, a modern digital command link modem, but also replace the legacy autopilot and its embedded control laws. Replacement of the legacy 5G22/5G23/5G24 CW semi-active homing radar seeker in the 5V21 and 5V28 / SA-5 Gammon missiles would follow a similar pattern and is also a low risk and low development cost effort. The low cost and technological risk involved in performing a seeker block upgrade of this kind raises other issues, as it is conceivable that it could be performed covertly and present a "strategic surprise" scenario in combat. Retrofits to legacy command link guided missiles are more challenging, insofar as both the S-75 / SA-2 and S-125 / SA-3 missile rounds would require more radical surgery, with the complete replacement of the radio proximity fuse, command link receiver, and autopilot. Whether the replacement seeker is infrared or active radar, the missile nosecone would need to be replaced and nose mounted hardware repackaged. Such an upgrade would however not only improve the lethality of the weapon, but also significantly extend its viable service life, with periodic relifing of solid propellants and pyrotechnics. Given the declining global inventory of the S-75 / SA-2, the S-125 / SA-3 is a more viable candidate. In summary the technical risk and effort involved in seeker retrofits varies from low to modest, and given the significant lethality gains which result, we should not be surprised to encounter them in future conflicts. The 9B-1348 family of active radar terminal / inertial/datalink midcourse guided seekers developed for the RVV-AE / R-77 / AA-12 Adder AAM has produced important spinoffs. These are the 9B-1103M series of seekers, offered as new build or retrofit active radar seekers for AAMs or SAMs. The Agat 9B-1103M-200 is intended for the R-27A/AE / AA-10 Alamo, and is directly derived from the R-77 9B-1348E seeker. The latest subtype of this seeker is claimed by Agat to use the Texas Instruments TMS-320 digital signal processing chip, widely used in Western radar equipment. The 9B-1103M-350 is a variant which is specifically designed as a replacement retrofit seeker for existing new build or legacy semi-active homing SAM seekers, with the 3M9/9M9 (SA-6) and 9M38 (SA-11/17) cited as specific targets for such upgrades. Active post launch, where the SAM goes active once off the launch rail and homes to impact. This mode is limited to short ranges. Inertial midcourse with active terminal homing, where the SAM flies out to a preprogrammed box and autonomously acquires the target. Inertial midcourse with datalink updates and active terminal homing, where the SAM flies out under datalink control and autonomously acquires the target. The latter two modes are especially of interest since the engagement radar may be operating in a track while scan mode and the victim may not know it is under attack unless it can detect the missile uplink transmissions, in the latter of the two modes. The latter two modes are also compatible with third party tracking where the engagement radar is not emitting search or track signals, launching and guiding the missiles against an aimpoint provided by another sensor such as an Emitter Locating System or other radar. 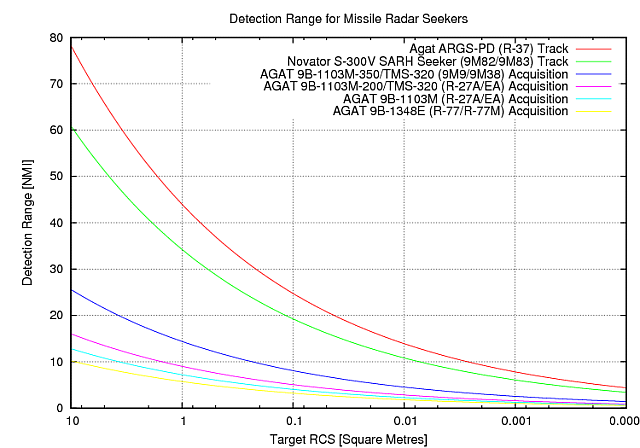 Other than flexibility in guidance modes and reduced warning time, active radar seekers also present opportunities to engage multiple and separated targets concurrently within a sector covered by the engagement radar. Since Agat first displayed the 9M1103M-350, the company has developed an enhanced 240 mm diameter seeker for the R-37 / AA-13 Arrow AAM, which is capable of acquiring a 5 m2 target at 70 km range. The range of derivative seekers produced by Agat present upgrade opportunities for a number of SAM types other than the SA-6/11/17 initially targeted by the company's marketing effort. 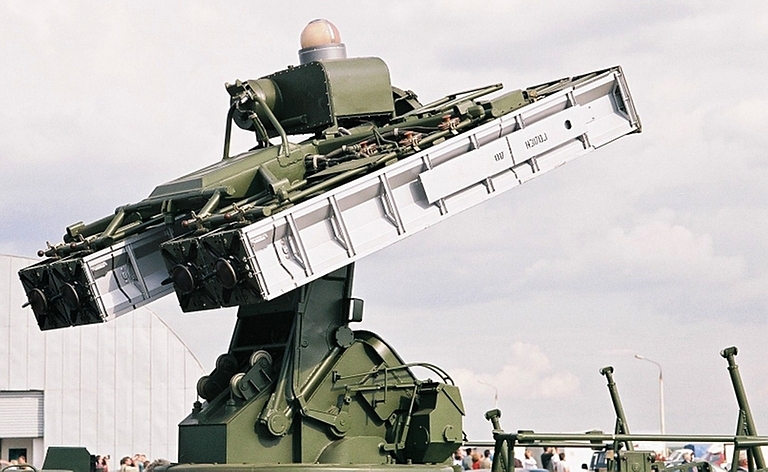 There are respectable inventories of the legacy SA-3, SA-5, SA-8 and SA-10 in many nations, which if retrofitted with modern active radar seekers become significantly more lethal and survivable. Agat AAM seekers. 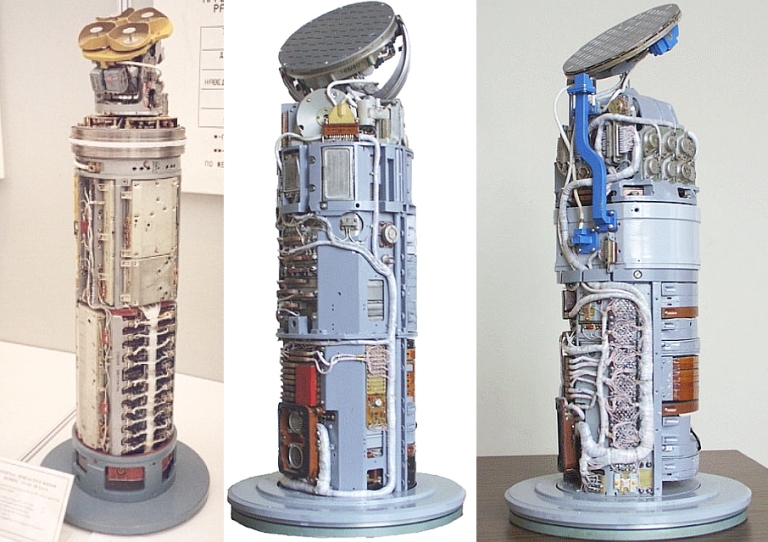 Left to right: 9B-1101K dual plane monopulse semi-active homing seeker used in R-27R1/ER1, 9B-1348E active radar homing seeker used in R-77 variants, and 9B-1103M active radar homing seeker for R-27EA (Agat). Avtomatika L-112E anti-radiation seeker. This family of seekers employs a characteristic gimballed multiple baseline interferometer design which uses a cluster of seven wideband hemispherical spiral antennas, providing for pitch/yaw steering outputs and ambiguity resolution in both axes. The design is a credible candidate for larger SAM airframes such as the 48N6E series and 5V28 series (© 2009 Vitaliy V. Kuzmin). The installation of anti-radiation seekers in SAM airframes is not a new idea. The PLA's FT-2000 anti-radiation SAM was built with a wideband anti-radiation seeker. Narrowband Home-On-Jam (HOJ) capability has been installed in a range of semi-active and active homing radar missile seekers, primarily intended to discourage active jamming of the missile seeker. 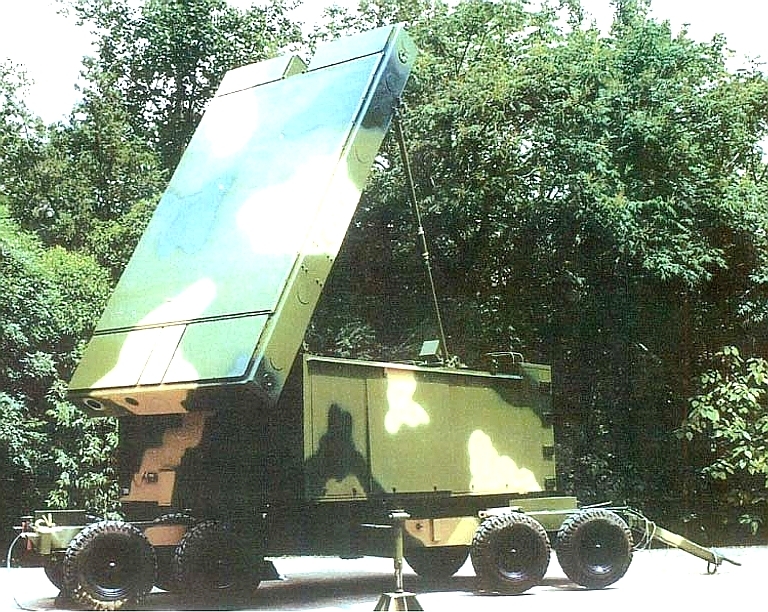 The MIM-104B ASOJ Patriot variant is credited with such a capability. There are no open source reports of dedicated anti-radiation seekers being installed in recent Russian SAM designs. A narrowband passive anti-radiation capability is likely in more recent semi-active and TVM capable seekers, as this capability exists in supersonic anti-shipping missile active radar seekers of similar size. There are no fundamental technical obstacles to the retrofit of a wideband anti-radiation seeker to larger Russian SAM airframes, such as the 48N6, 9M82, 9M83 or legacy 5V28. Existing seekers such as the Avtomatika L-111E/112E/113E series used in subtypes of the Kh-31 / AS-17 Krypton anti-radiation missile are geometrically and volumetrically compatible with these SAM airframes. Guidance adaptations would not be particularly challenging where the missile employs midcourse command link / inertial guidance, the principal aim being to fly the missile into a viable acquisition basket for the seeker, and cue the seeker to acquire the intended emitter. Modern anti-radiation missile seekers are usually capable of autonomous target acquisition, or re-acquisition should an emitter go silent transiently. The technology is certainly available to inexpensively equip any number of recent Russian SAM airframes with anti-radiation seekers. Passive targeting capability via emitter locating systems such as the 85V6 Vega / Orion or Kvant 1L222 Avtobaza presents no difficulty, both designs have been integrated with the S-400 / SA-21 fire control system. The CONOPS for such a system would involved passive angle tracking and ranging on an emitter, with the SAM round flown out under command link control to a geometrically optimal position, upon which the anti-radiation seeker would acquire the target and terminal homing would be performed. Existing control laws for terminal homing in HOJ modes would be viable. Until terminal homing is initiated, a defending aircraft will have no easy means of determining whether an inbound SAM is fitted with an anti-radiation seeker. This will complicate defensive countermeasures scheduling and defensive tactics. A salvo of two SAMs, one with an anti-radiation seeker, and one with an active or semi-active homing seeker, will present similar difficulties to those seen with the use of mixed seeker types in Beyond Visual Range (BVR) AAM attacks. Most upgrade packages offered for the S-75 / SA-2 Guideline involve technology insertion for the SNR-75 Fan Song engagement radar, which is otherwise highly vulnerable to Western countermeasures (Czech Army image). 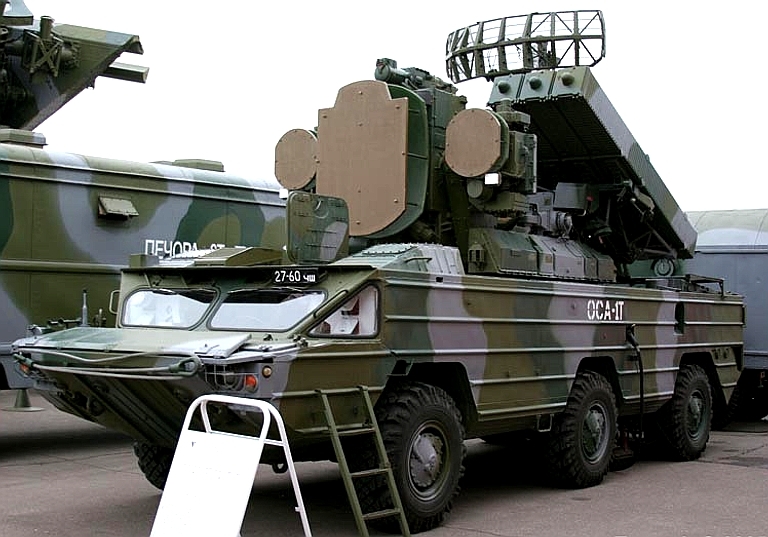 The ubiquitous S-75 / SA-2 Guideline can claim the distinction of being the most widely exported area defence SAM system of all times. While now regarded to be obsolescent, it still remains widely used, with China still operating ~60 batteries. 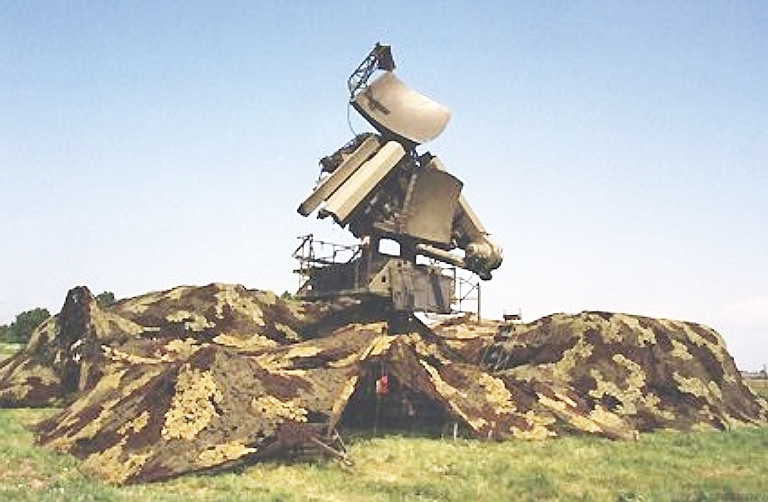 Each six launcher battery uses a single SNR-75 Fan Song / Gin Sling engagement radar. The missile round uses a liquid propellant terminal stage with a solid propellant first stage booster. 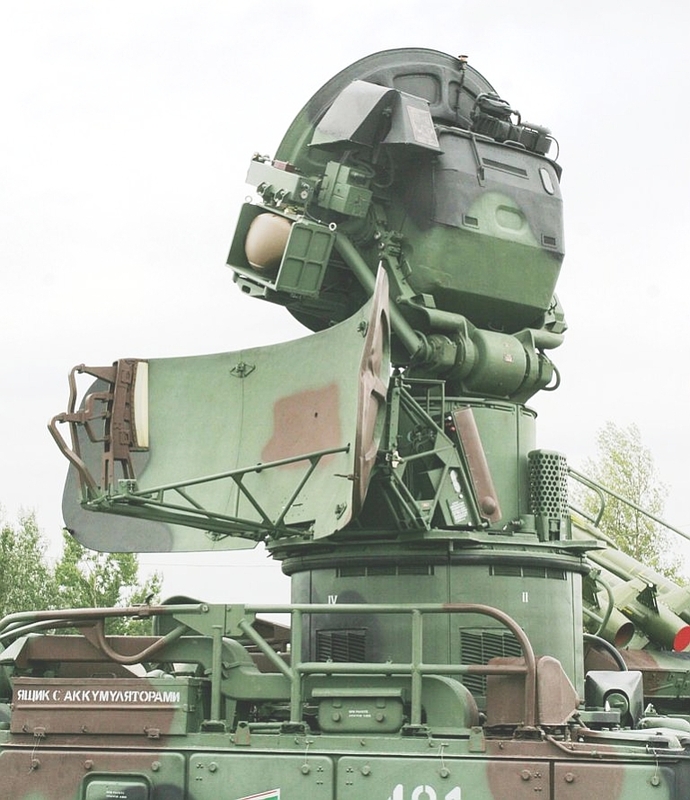 The PLA reverse engineered the Soviet V-75/S-75 Dvina / SA-2 Guideline SAM system during the 1960s, including the SNR-75 Fan Song radar, the SM-90 launcher and the PR-11AM transporter/transloader. Since then the PLA developed a significantly improved HQ-2B variant. China is reported to still be supplying spare parts for a number of operators, and is known to have supplied the system to Iran. There are at this time a number of known upgrades on offer, and two known fully mobile TEL designs for the S-75, one developed by the Chinese and one by the Cubans. Almaz-Antey launched in 2001 the Volga-2/2A package of technology insertion upgrades for the legacy S-75/75M designs, using digital components previously used in the S-300PMU1/2 / SA-20 Gargoyle. 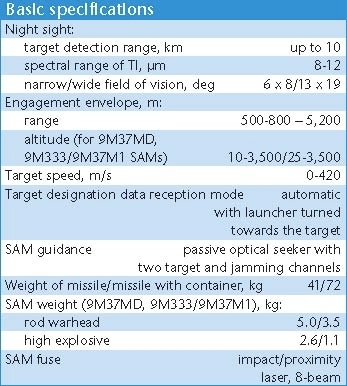 Russian sources claim the following enhancements to the design via the use of new digital components: improved countermeasures resistance for the missile uplink and radar; automatic tracking modes for targets, extended kinematic range via better control law design, and cope with adverse ECM environments. The ability to acquire and track targets, and guide missiles, when subjected to noise jamming intensities of 2000 W/MHz produced by a standoff jammer at 100 km range. Increased clutter and chaff rejection performance. 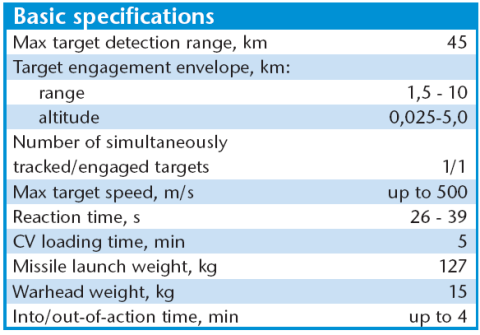 Extended missile kinematic range to 60 km. Maintain target tracks in the event of temporary signal loss. Reduced automatic target tracking error to 0.02 mrad. Estimate target altitude relative to horizon to improve Pk against low flying targets. Reduced power consumption by 40%. 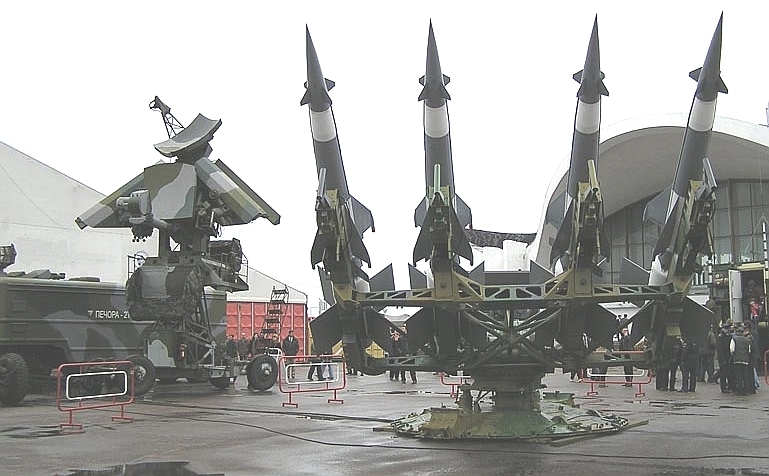 Russian sources also claim 90% commonality with the Almaz-Antey S-125 / SA-3 Goa upgrade package. угловые ошибки сопровождения целей в "МВ"
In 2003 Tetraedr in Belarus announced the development of the S-75-2T Volga-2T upgrade package for the S-75 / SA-2 system. This upgrade draws upon the technology base developed for upgrades of the S-125 / SA-3 system. It is not currently detailed on the Tetraedr website. The upgrade package on offer is to provide a comprehensive technology replacement of all key components in the SNR-75 Fan Song engagement radar. Cited improvements include a reduction of the system down to two trailers, digital data and signal processing, new missile control laws to extend range, and a mobility upgrade with a 20 minute stow/deploy time. Tetraedr also offer overhauls and zero timing of 20D and 5Ya23 missile rounds for the system. The H-200 phased array engagement radar was developed to support the new HQ-12/KS-1A SAM system. Hybridisation of the H-200 radar and the existing HQ-2B/J missile system would transform the capabilities of the HQ-2, and open up a large export market for the H-200 and other Chinese radars (Chinese internet images). Some evidence has emerged, albeit inconclusive as it is not supported by public disclosures, that the PLA may be hybridising its new HQ-12/KS-1A SAM system with the legacy HQ-2B/J / CSA-2 Guideline SAM system. 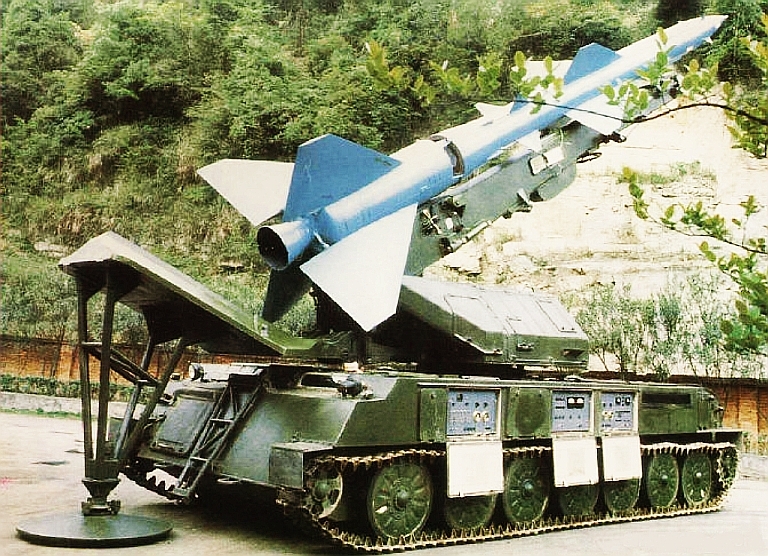 The PLA remains the world's largest single user of the SA-2, with domestically re-engineered missile rounds and SJ-202 Gin Sling series engagement radars. The PLA has also deployed a fully mobile HQ-2 TEL on a tracked chassis. In practical terms the PLA has a large material and intellectual investment in the SA-2 family of weapons. Hybridising the HQ-2 and HQ-12 would therefore make sense economically as it would allow exploitation of the HQ-2 inventory and warstock until the type is wholly replaced by newer technology weapons. As the HQ-2 is a simple command link guided missile, hybridisation with a newer missile system involves only the installation of software and hardware in the engagement radar which cues and commands the HQ-2B TELs or static SM-90 launchers, permits tracking of the missile, and which generates uplink commands to the missile during flight. With the Fan Song / Gin Sling operating at X-band (G/E/F depending on subtype), and given the robust antenna bandwidth available with a transmissive space feed PESA arrangement as used in the H-200 engagement radar for the HQ-12/KS-1A, there would be no fundamental technological obstacles to adapting the H-200 to provide a midcourse tracking and command uplink guidance capability for the HQ-2 / SA-2 missile round. It is worth observing that Chinese sources claim the predecessor to the KS-1A, the KS-1, employed the same Gin Sling engagement radar as the HQ-2B/J. If this is true, then the degree of commonality in missile electronics and waveforms between the KS-1A and HQ-2B/J could be very high, facilitating hybridisation. A HQ-2B/J missile battery equipped with a modern frequency hopping H-200 engagement radar and a JY-11/JY-11B, YLC-18, JYL-1 acquisition radar becomes an entirely different proposition to the legacy article, in terms of its engagement envelope, tactical mobility, and its resistance to jamming. Given the large number of existing users of the S-75 / SA-2 and HQ-2 / CSA-1 on the global stage, China could well have a major commercial motive to develop a hybrid domestically, since it would open a significant export market for the H-200 radar, and its competitor, the SJ-231, as well as replacement JY-11B, YLC-18 and JYL-1 acquisition radars. WXZ204 HQ-2B TEL in deployed configuration. A tracked TEL, the WXZ204, was developed to replace the cloned SM-90. The PLA remains the single largest user of the S-75 globally, even though the weapon is being progressively replaced. The tracked TEL chassis appears to be a unique design, but evidently using components from the Type 63 light amphibious tank, itself a derivative of the Soviet PT-76 [Click for more ...]. Cuban SA-2 TELs on parade in Havana, 2006 (via Vestnik-PVO). Cuba has developed and deployed an indigenous TEL based on the Soviet SM-90 launcher and the obsolete T-55 tank chassis. 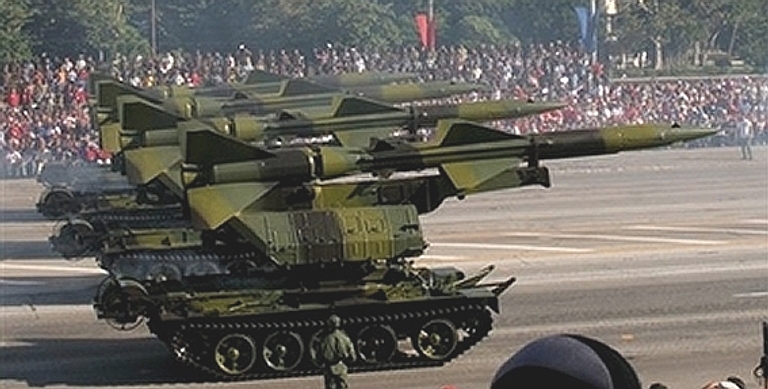 The total number of conversions is unknown, but multiple TELs were publicly displayed during the 2006 Havana parade, and TELs have been displayed in two very different camouflage patterns suggesting multiple units equipped with the design. 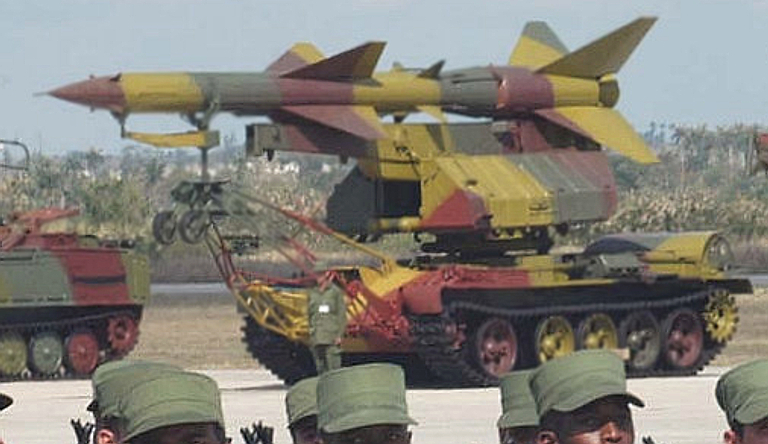 This design shares features with the Cuban SA-3 TEL design, and differs in many respects from the PLA HQ-2 TEL. This image shows the wheeled support frame for the nose of the missile round, in stowed position for transport. This frame is removed from the TELs used for the street parade. This is a fundamentally different design approach to the WXZ204 HQ-2B TEL, where the launch rail was extended. This image shows the cable spool mounted on the aft of the tank hull. This suggests that during deployment of the battery the TEL is used to lay the interface cable from the Fan Song. A similar arrangement is used on the Cuban SA-3 TEL (via Vestnik-PVO). 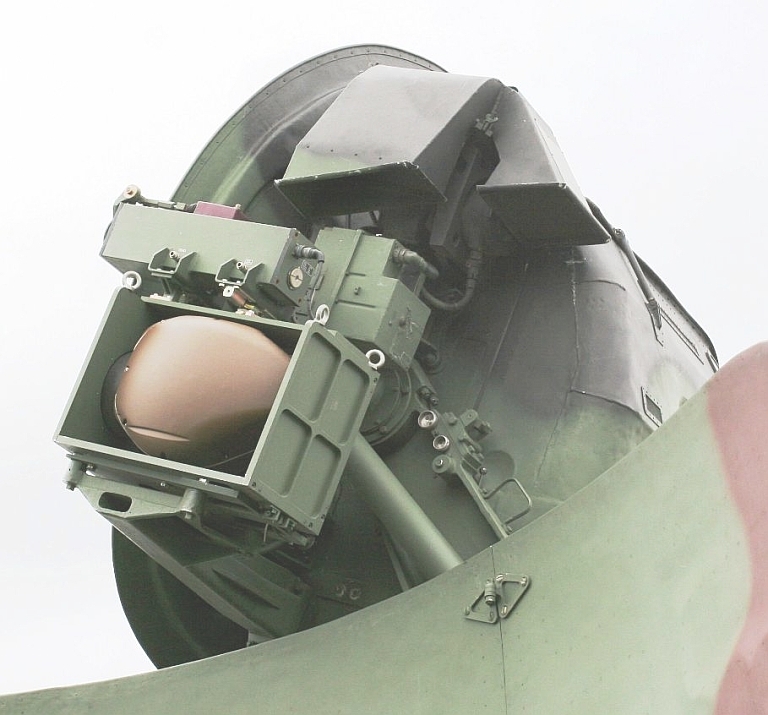 As with the S-75 / SA-2 Guideline, most upgrade packages offered for the S-125 / SA-3 Goa involve technology insertion for the SNR-125 Low Blow engagement radar, which is otherwise highly vulnerable to Western countermeasures (Czech Army image). 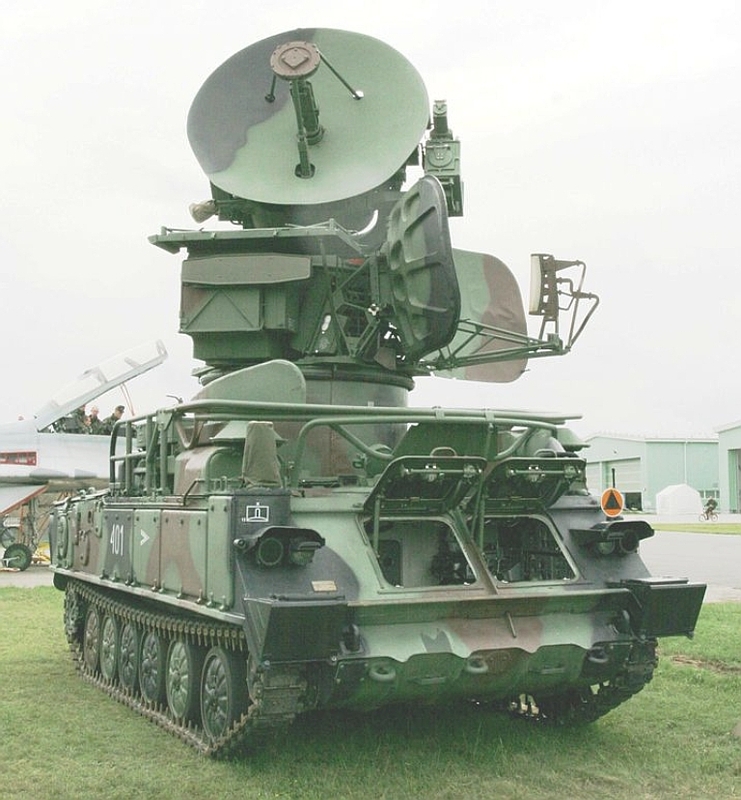 Following the end of the Cold War, a number of upgrade packages have emerged for the S-125 / SA-3 Goa, mostly involving digital upgrades to the radar and guidance package, but some involving rehosting on vehicles to provide a mobile rather than semi-mobile capability. The S-125 / SA-3 Goa has been a more attractive target for upgrades compared to the S-75 / SA-2 Guideline, as the missile is newer by design, and less cumbersome to support as both stages uses solid propellant motors. Tetraedr's upgraded UNV-2T Low Blow for the Pechora 2T system. 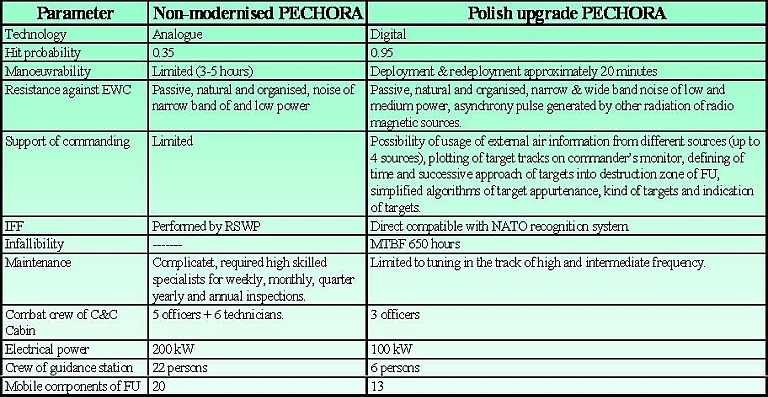 Tetraedr have developed two upgrade packages, the Pechora 2T and further enhanced Pechora 2TM. These upgrades involve redesign of key radar components, a new upper antenna aperture, and revised autopilot software. For the Pechora 2T the cited improvement in jam resistance is 2700 W/MHz (AWGN) vs 24 W/MHz for the legacy design, suggesting the use of a frequency hopping design with a better than 100:1 spreading ratio. The Pechora 2TM uses an new trailer for the UNV-2TM Low Blow. A CPTЗ-125 seduction decoy is packaged into the upgrade. Deployment time is 20 minutes. Tetraedr are offering a heavily upgraded UNV-2TM Low Blow on a new design towed chassis as part of the Pechora 2TM upgrade (© 2011 Michael Jerdev). Above, below: Upgraded Tetraedr 5P73-2TM four rail launcher (© 2011 Michael Jerdev). 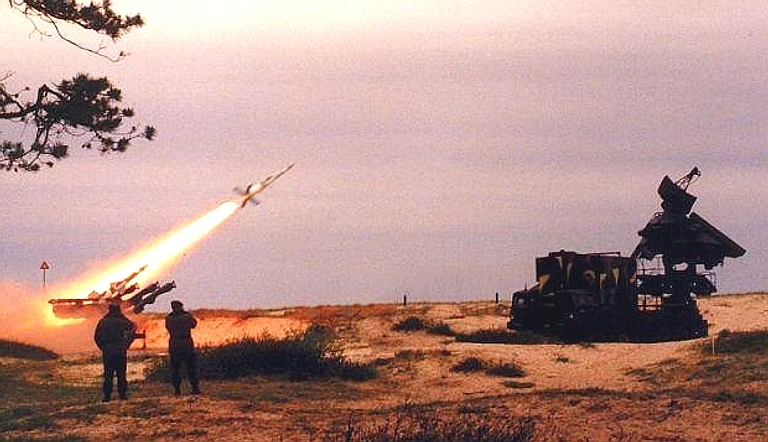 5V27 Goa missile launch (Tetraedr). S-125 / SA-3 and S-125-2T Pechora 2T block upgrade firing trial results. 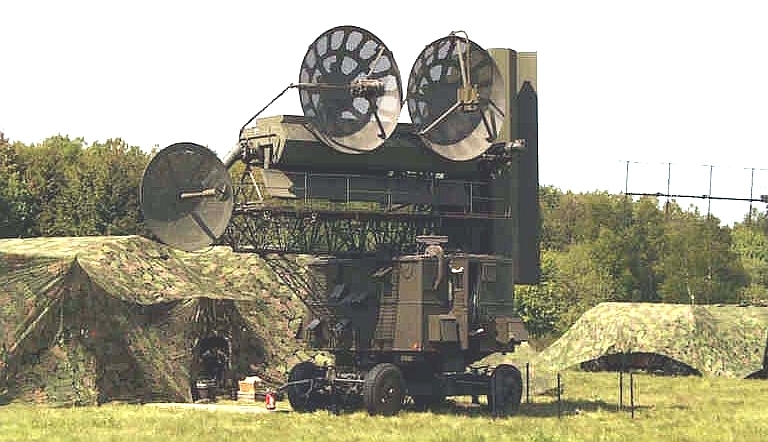 The Pechora 2T is a characteristic of contemporary digital block upgrades to widely used Soviet era SAMs. The improved autopilot algorithm in the updated SNR-125 significantly extends the engagement envelope of the weapon system. The best range achieved was 16 NMI. Provisional data - Tetraedr JSC. 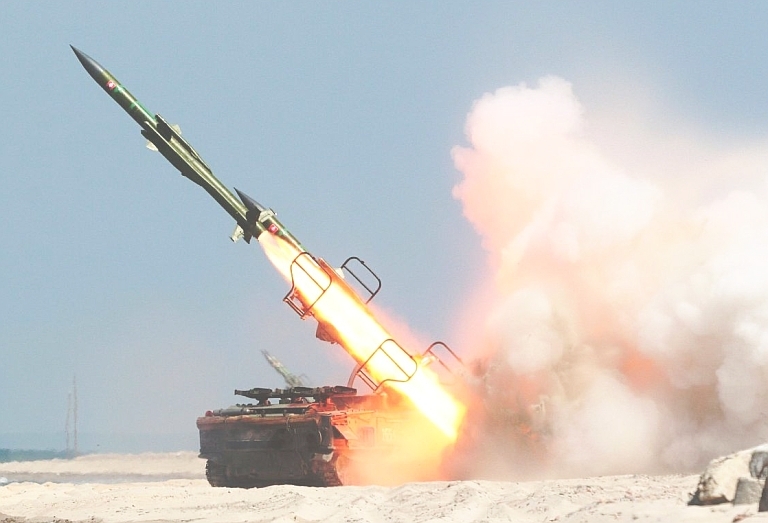 Launch of the upgraded Pechora-2M from an MZKT-8022 TEL (Defense Systems). 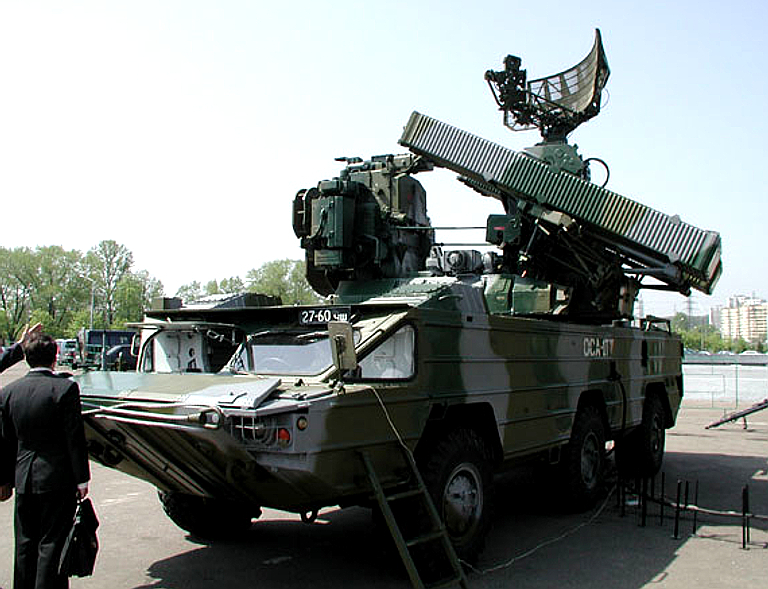 Russian and ByeloRussian industry via a joint company, Oboronitelnye Sistemy, developed the Pechora 2M upgrade package using a wheeled TEL, and the system was exported to Egypt in 2006. The system is designed to deploy and stow in 25 minutes. The upgraded 5V27D and 5V27DE missiles feature new fuses and warheads, and the electronics have been comprehensively upgraded with digital hardware, an electro-optical tracker has been added. 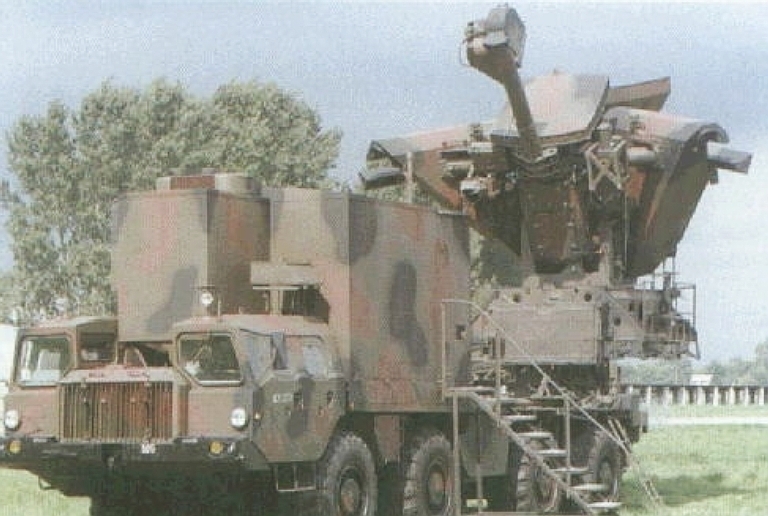 An interesting feature of this design is that the 5P71 launcher has been transplanted on to a 6 x 6 MZKT-8022 truck, as has the SNR-125 Low Blow engagement radar. Egypt is cited as the first export client. The modernisation programme for the S-125 Pechora air defence missile system developed by the Kuntsevo Design Bureau, involves two variants: self-propelled Pechora-2M (S-125-2M) and containerised Pechora-2K (S-125-2K). The S-125 Pechora ADMS upgrades are designed to protect administrative, industrial and military installations against air strikes by aircraft, helicopters and cruise missiles (including stealth ones) in simple and complex jamming conditions. operational and maintenance characteristics are improved by reducing maintenance/servicing time thanks to the introduction of automated test equipment and providing smooth spare parts supply. power supply system, consisting of the RKU-N distributive cabin and 5E96A diesel-electric power station, KU-03T cable layer (containerised variant). The PRM-NM1A mobile repair shop with a single SPTA set, sets of cables, and an ECCM system are offered optionally. Thanks to the introduction of the second UNV-2M antenna post, the upgraded ADM systems enjoy enhanced channel capacity: two target channels, and up to four missile channels. On customer request, the ADM system delivery set can be changed to include foreign-made equipment, chassis, materials, software, components, etc. Дальняя граница зоны поражения на высоте 5-20 км - 32 км (при применении ЗУР с модернизированным стартовым двигателем).Верхняя граница зоны поражения - до 20 км. - дальность обнаружения цели с ЭОП = 2 м2 более 100 км. Введена двухканальная оптико-электронная система (ТВК, ТПК) с обеспечением автосопровождения (АС) цели в дневных и ночных условиях. Предусмотрено повышение 'канальности' по цели за счет возможности подключения второго антенного постава УНВ. - увеличения расстояния между УНВ и УНК до 200 м. - увеличения между УНВ и ПУ до 150 м. - цифровой 4-х канальной системы СДЦ. Была предусмотрена применительно к комплексу 'Печора'. Улучшена обитаемость и комфортность кабины управления УНК (введены два производительных малошумящих кондиционера). Номенклатура запчастей (в ЗИП-1 и ЗИП-2). Предусмотрено обеспечение поставок ЗИП на весь период эксплуатационного срока службы как модернизированной, так и не модернизированной аппаратуры. Запасные части - 300. Pechora 2M operator stations using COTS LCD displays. 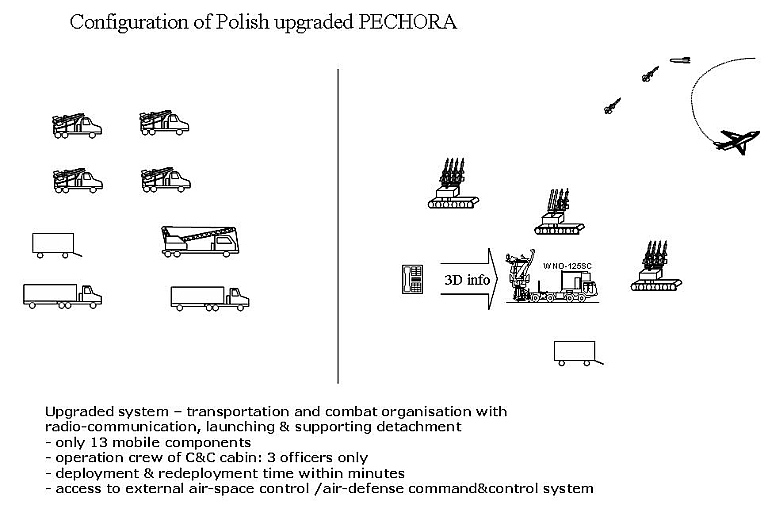 The Pechora 2M upgrade includes a fully mobile Low Blow offered on alternative MZKT-8022 truck chassis. 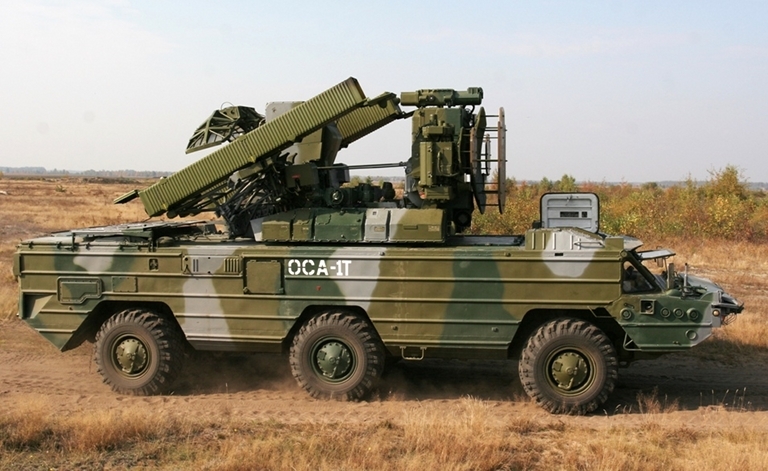 Above: The Pechora 2M TEL is based on a 6 x 6 MZKT-8022 chassis and uses the two round 5P71 launcher. Below: The Low Blow is also carried by the same vehicle (© 2011 Michael Jerdev). 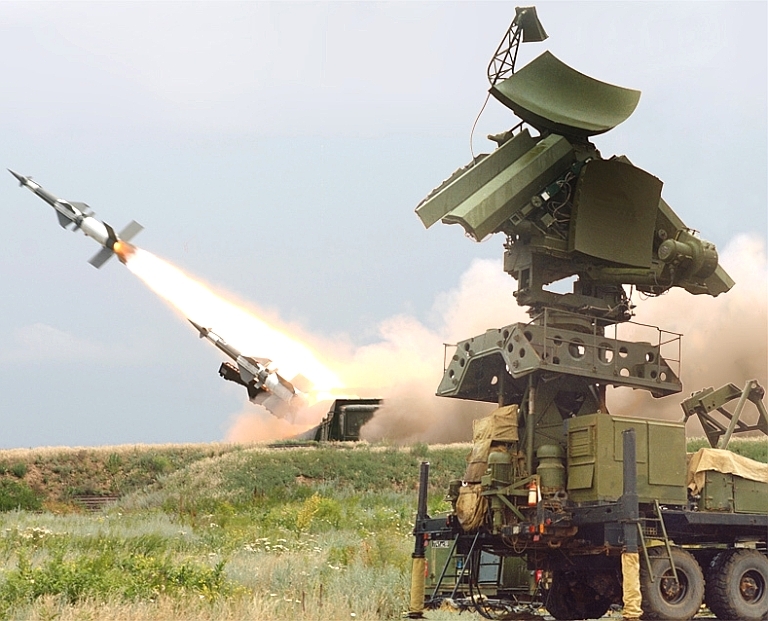 Almaz-Antey are offering the Pechora 2A technology insertion upgrade for the legacy S-125 / SA-3 Goa design, using digital components previously used in the S-300PMU1/2 / SA-20 Gargoyle. There is 90% commonality with the S-75-2 / SA-2 upgrade package. improvement of operational characteristics, including partial automation of combat work; substitution of some units with up-to date hardware; upgrading of the crew training facilities; reduced volume and duration of scheduled maintenance works; enhancement of operational reliability; prolongation of service life; reduction of power consumption. The KU-03T cable layer with a set of cables can be delivered additionally. At customer request, delivery set of the S-125-2A Pechora-2A ADMS can be supplemented with foreign-made equipment and facilities. Polish designed Cenrex Newa SC S-125M upgrade package CTM-2/T-55 TEL in the foreground, and SNR-125 Low Blow in the background (Tetraedr image). The Polish Army pursued an extensive upgrade, part of which involved converting the S-125 system to a fully self-propelled design, under the Newa-C and -SC effort. Initially, it was intended that the SNR-125 Low Blow and 5P73 be carried on a CTM-2 (T-55) tank chassis, but the vibration and size of the vehicle proved incompatible with the radar. 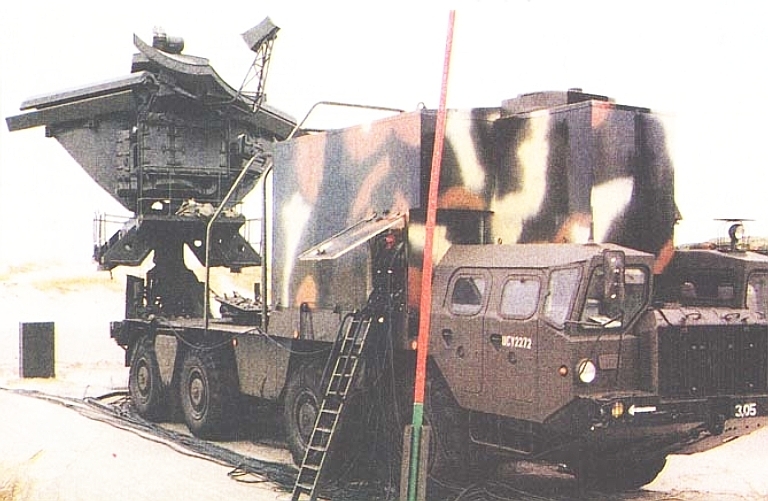 The second iteration was to rebuild surplus 9P117 Scud TELs, to carry both the SNR-125 radar and 5P73 launcher. The latter proved technically successful but the supply of local Scud TELs was not sufficient to support the Polish Army program, and a compromise using the tank chassis for the TEL and Scud launcher chassis for the radar was adopted. Polish sources claim the marketing of this upgrade to India was blocked by the Russian government. The upgrade involves replacement of all legacy electronic hardware with digital COTS hardware and software. 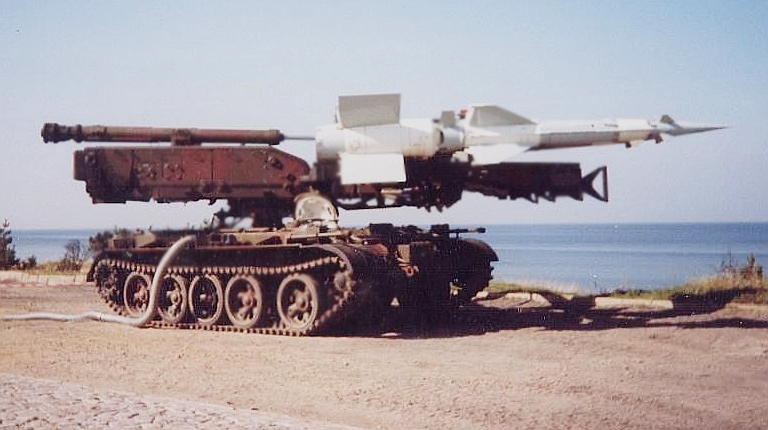 The Polish Newa-SC WNO-125SC upgrade sees the hitherto towed SNR-125 Low Blow carried by a MAZ-543 8 x 8 "Kashalot", salvaged from retired 9P117 Scud TELs. Upper image with C2 cabin removed. Additional images ,  (Cenrex images, Tetraedr image below). 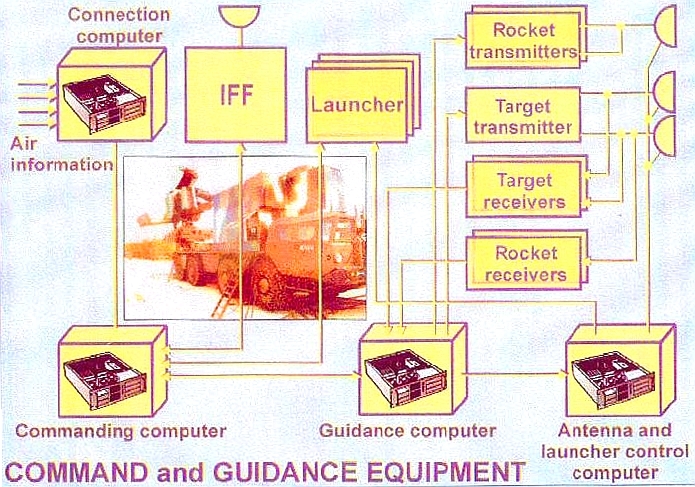 Uplink transmit/receive labelled as "Rocket", radar transceivers labelled as "Target". Test launch of the Newa SC, note the installed cabin on the WNO-125SC Low Blow. 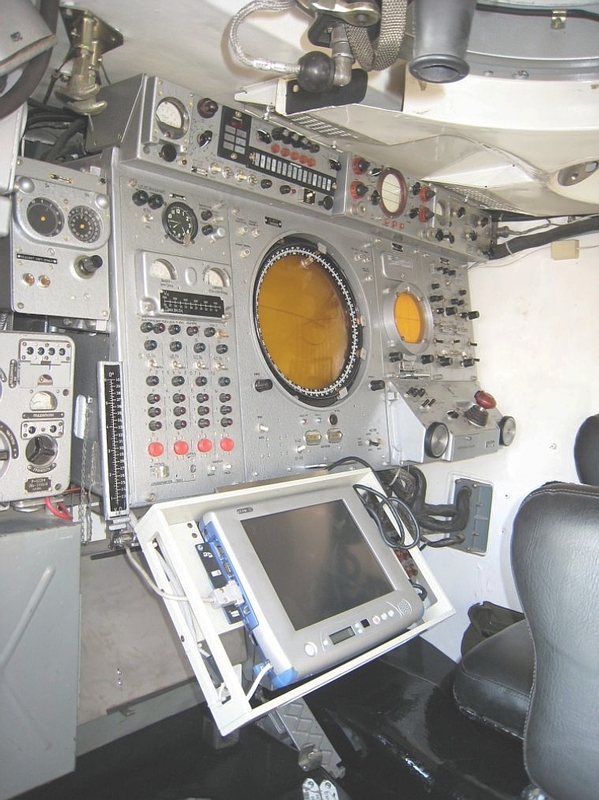 Newa-SC missileer console using LCD panels and COTS hardware (Cenrex). Polish designed Cenrex Newa-SC S-125M upgrade package CTM-2/T-55 TEL (Cenrex images). Polish MAZ-543 TEL demonstrator rebuild from a 9P117 Scud TEL. The wheeled 5P73 TEL configuration remains on offer. Additional image . Cuban SA-3 TELs on display (via Vestnik-PVO). Cuba has developed and deployed an indigenous TEL based on the four rail 5P73 launcher and obsolete T-55 tank chassis. 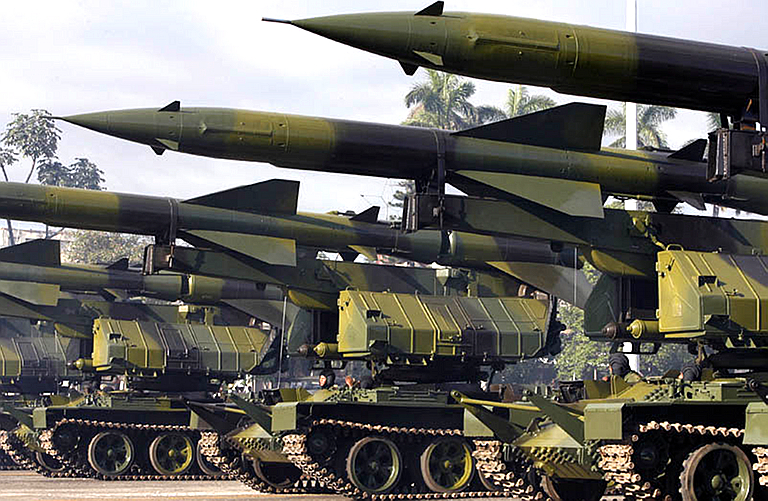 The total number of conversions is unknown, but multiple TELs were publicly displayed during the 2006 Havana parade. This design is sufficiently different from the Polish Ankol/Cenrex design to be safely considered unique. This image shows the large aft mounted cable spool and empty outboard launch rails well. No images have surfaced to date showing all four rails loaded. 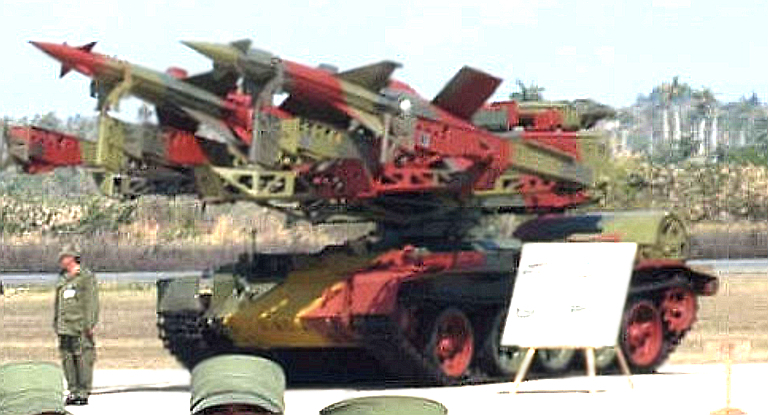 SA-3 TELs in foreground, SA-2 TELs in background (via Vestnik-PVO). SA-2 TEL, SA-3 TEL and SA-13 Gopher on display. 5N62 Square Pair 'Illumination and Guidance Radar'. This FMCW long range target illuminator uses separate paraboloid sections each for the transmit and receive paths, with the central body used to prevent spillover. The radiating elements from the antenna feeds are mounted on the central body. The legacy S-200 family of 160 nautical mile range class long range SAMs has been largely replaced in Russian service by more recent variants of the S-300PMU family of systems. Nevertheless the system is of some interest as it was exported to a number of Soviet client states, including Belarus, Uzbekistan, Bulgaria, the Ukraine, Czechoslovakia, Hungary, Poland, India, North Korea, Libya, Syria, and more recently Iran. Much of this proliferation occurred after the 1998 fire sale of former PVO-S warstock and inventory, as the S-200 was phased out of Russian service. Upgrades are on offer, include a facility to hybridize the SA-5 with the SA-20 Gargoyle. 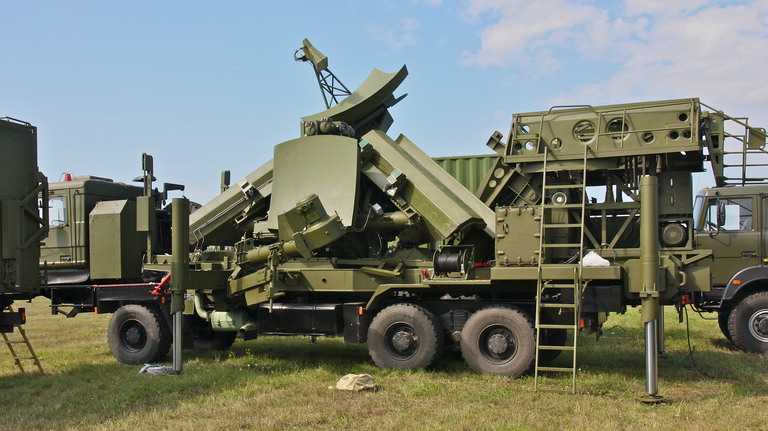 The semi mobile 5P72 series launchers used with the SA-5 are often installed in permanent revetments. This image shows a 5P72 and a late model transporter/transloader. 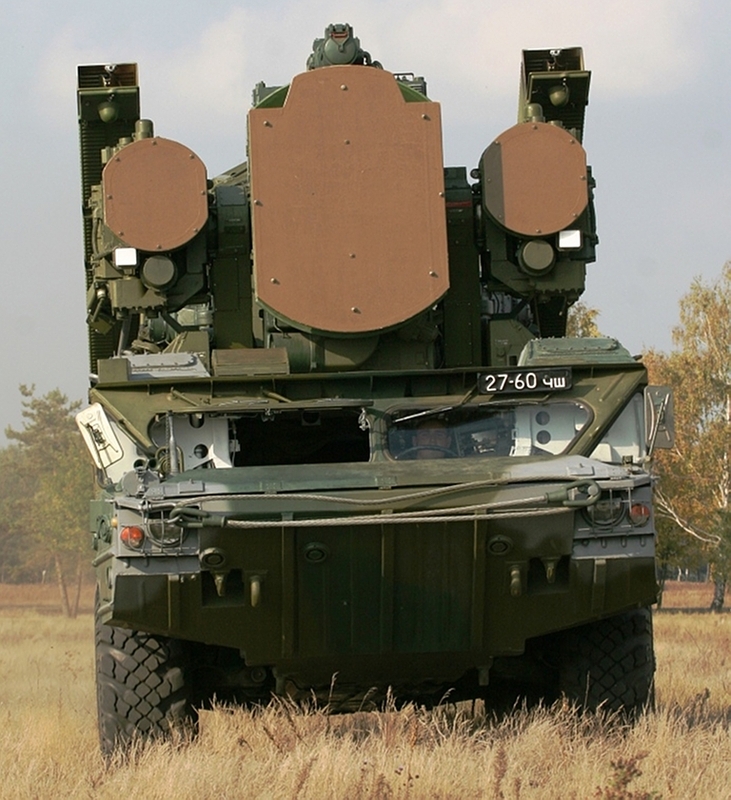 The S-300PMU2 30N6E2 Tomb Stone engagement radar (Said Aminov, Vestnik PVO). Interfaces and software are available for the S-300PMU2 Favorit / SA-20 Gargoyle and S-400 Triumf / SA-21 to control the S-200 Angara/Vega/Dubna / SA-5 Gammon and its 5N62 Square Pair engagement radar. 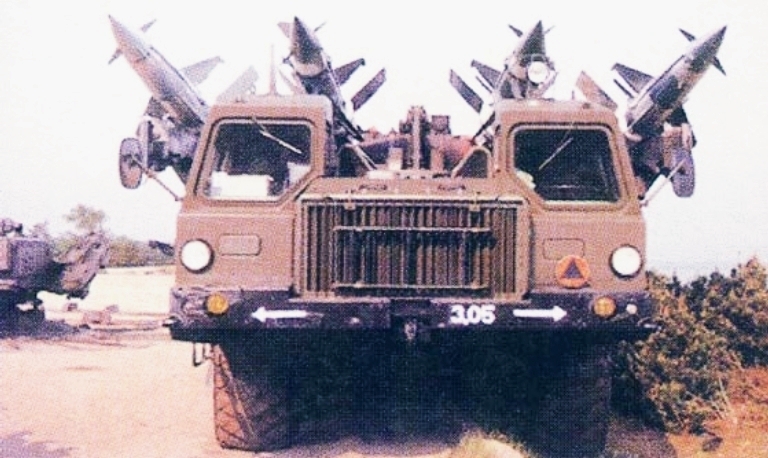 In this arrangement, an SA-20/21 system with its high power aperture and highly jam resistant acquisition and engagement radars prosecutes an engagement, but rather than launching its organic 48N6 series missile rounds, it uses the SA-5 Gammon round instead. The 5N62 Square Pair is effectively slaved to the 30N6E2 or 92N6E phased array engagement radar and acts as a specialised Continuous Wave illuminator, rather than long range target tracking and illuminating element of the battery. This model is analogous to the S-300V/SA-12 scheme, where the 9A82/83 TELARs with their CW illuminators are slaved to the 9S32 Grill Pan phased array engagement radar. The notion that any part of the cumbersome, slow and electronically vulnerable acquisition and tracking function of the Square Pair would be retained in the hybrid system makes no sense, and indeed it would nullify many of the benefits of using the hybrid in the first place. This has important implications for future combat against users of this hybrid system. 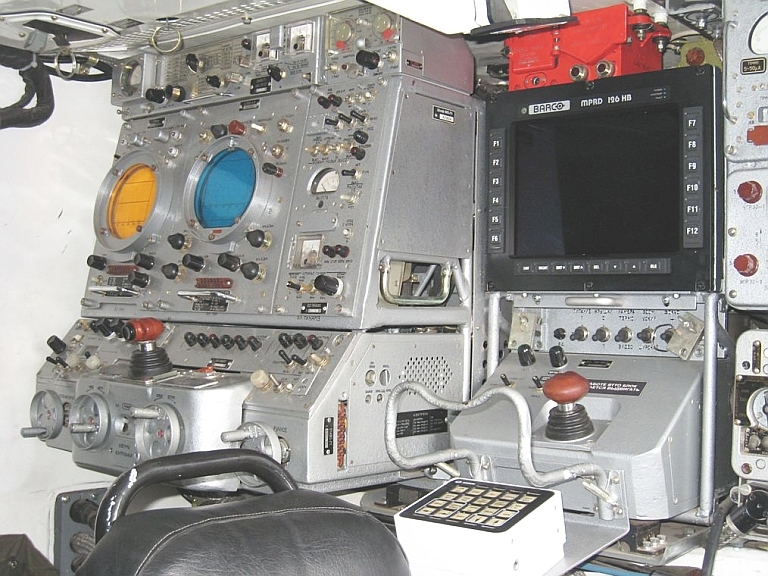 In the legacy SA-5 system, a search radar such as a Tall King or Bar Lock would cue the Square Pair engagement radar, which would search the area of interest with a narrow pencil beam in an automated spiral or raster pattern, or manually, until the target was acquired and tracked, upon which the SA-5 missiles with CW homing seekers were tuned to the CW carrier (in early variants) and then launched. As the 1980s skirmishes between the US Navy and Libyan air defences illustrated, US EA-6B Prowlers with their ALQ-99 jamming equipment were able to successfully disrupt tracking by the Square Pair and render the SA-5 missiles unusable. In a hybrid SA-5/SA-20/SA-21 system, attempts to jam the Square Pair will be ineffective as it is functioning as a simple open loop CW illuminator and missile command uplink transmitter. Because the SA-5 is a static system, operators can precisely calibrate the Square Pair in azimuth and elevation, and given the availability of Glonass, GPS and satellite imagery, this calibration is neither expensive in time or resources. 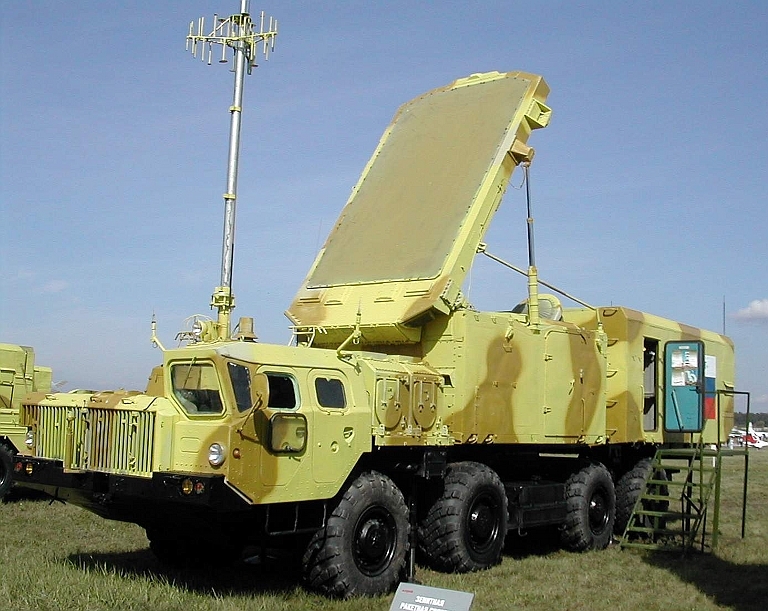 Once this has been performed it presents no difficulties for a Glonass/GPS equipped autonomous SA-20/21 battery to issue over a radio datalink launch and cueing commands to the SA-5 battery, and once the missiles have been launched, precision elevation and azimuth commands to the Square Pair to control illumination and missile uplink functions. Indeed, once such integration has been performed, it is an open question whether it would be even economical let alone operationally viable to retain the full SA-5 battery package of K-1, K-2, K-3 and K-9 trailers, as a rack of digital equipment installed in the Square Pair K-1/1M radar head trailer to provide interface and control functions would be cheaper to run and more effective in combat. 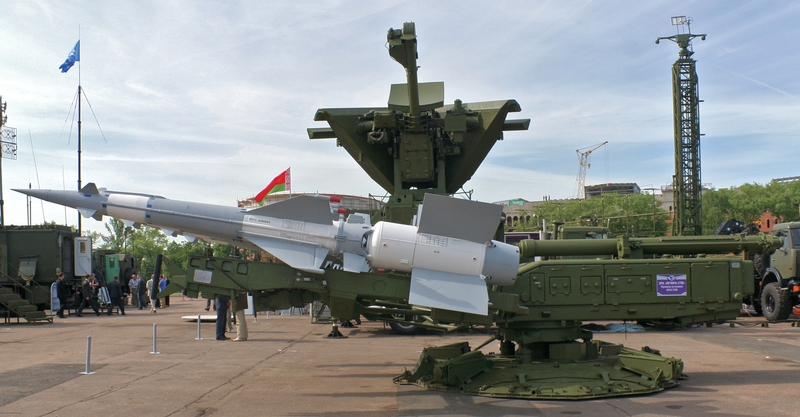 The challenge which a hybrid SA-5/SA-20/SA-21 system presents is considerable. 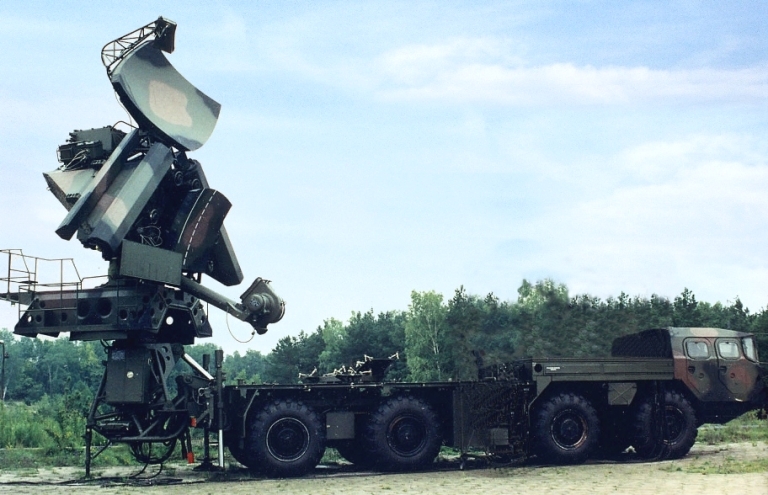 The SA-20/21 battery is highly mobile, and with modern digital frequency hopping radars, will be difficult to jam. Soft kill and hard kill become problematic. 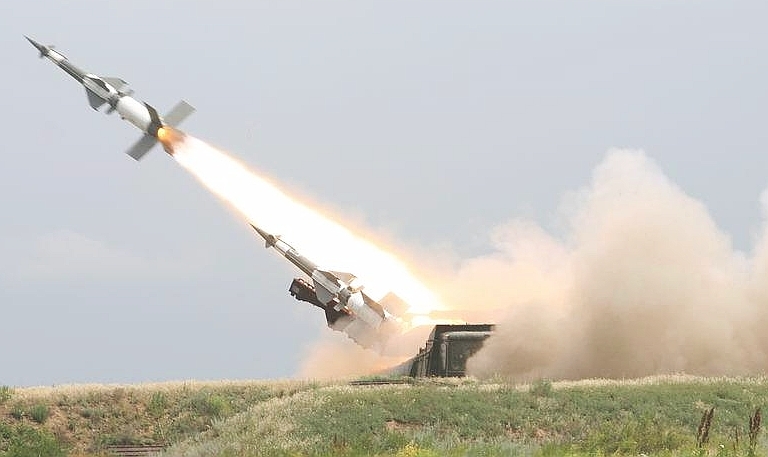 In terms of defeating the SA-5 component of the hybrid, the only option is to jam the missile CW homing seeker, the effectiveness of which will depend entirely on the vintage of the 5G24N series seeker and the capabilities of the jamming equipment. If the customer opts for an upgrade to the seeker electronics, the seeker may be digital and very difficult to jam. 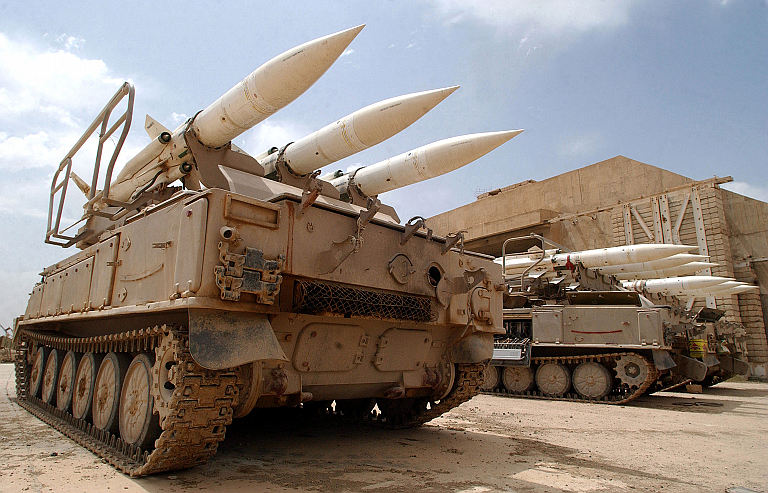 The hybrid SA-5/SA-20 option is available to nations using both of the SAM systems - a known instance being Iran. Tetraedr are offering a technology insertion upgrade for the S-200VE, in addition to the overhaul and zero timing of the 5V28VE missile round. It is not known whether this upgrade product has been exported to date. The digital technology insertion upgrade is intended to increase the capabilities and reliability of the system. Specific improvements claimed are in countermeasures resistance and kinematic range, indicating the upgrade includes the 5G22/5G23/5G24 CW semi-active homing radar seeker. Almaz-Antey are offering a similar upgrade package but have not disclosed any specific details to date. 3M9ME Gainful SAM launch from 2P25 TEL (image © Miroslav Gyűrösi). The Kub/Kvadrat / SA-6 Gainful system remains one of the most widely used legacy SAM systems. It is best known for its initial success during the 1973 Yom Kippur conflict when this system earned the nickname "three fingers of death". The system was used by the Soviet PVO-SV, most Warsaw Pact armies, and a wide range of export clients in the Middle East, Africa, with India becoming the biggest user in Asia. 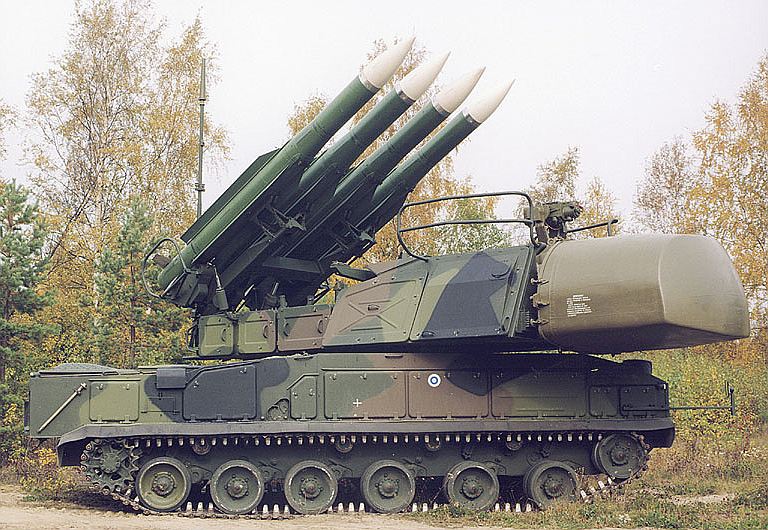 Deployed initially during the late 1960s, the SA-6 has been subjected to a wide range of upgrades, as a result of which many different configurations exist, including hybrids with the subsequent 9K37 Buk series. 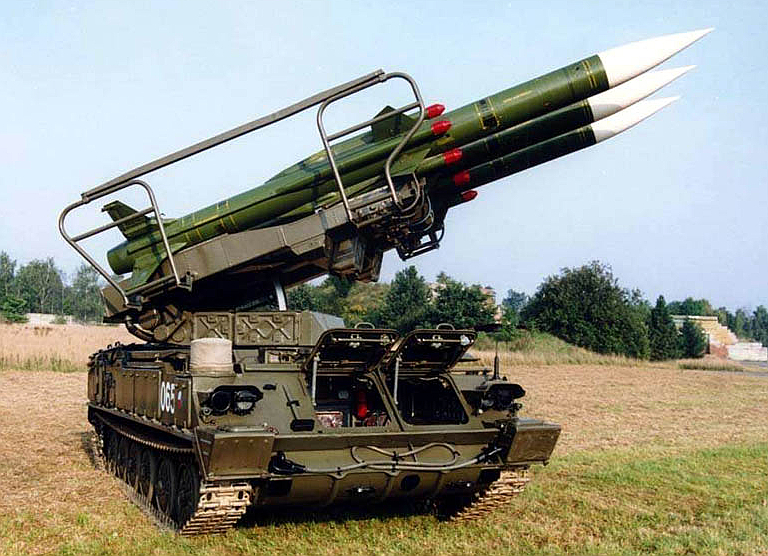 In Soviet service it was replaced primarily by the 9K37/M/M1 Buk/Buk-M/M1 (SA-11 Gadfly). Numerous upgrades exist for the 2K12 SAM system. Some users have fitted optical trackers to the Straight Flush. Agat have developed the 9B-1103M-350 active radar seeker, based on the RVV-AE / AA-12 "AMRAAMski" seeker, as a retrofit for the 9M9 SAM round. The larger antenna permits acquisition of a 5m2 target at 40 km range. The proposed Czech Army RETIA upgrade to the 1S91 includes COTS digital hardware and software, a solid state exciter for the magnetron transmitters, a fully digital coherent receiver with 75 dB dynamic range, and an optical tracker. 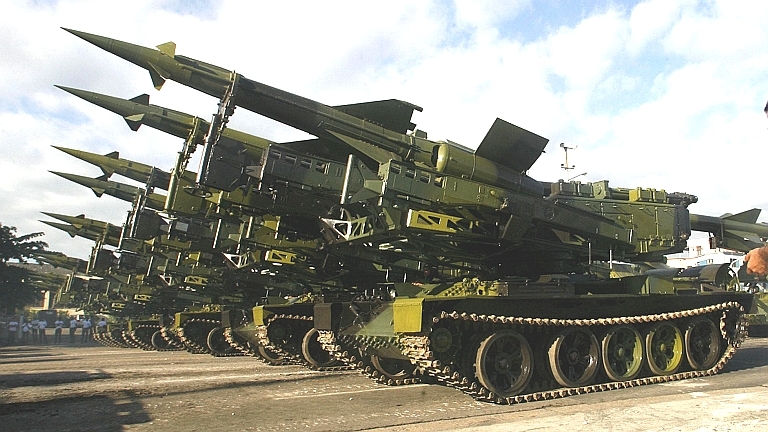 Egypt is reported to have procured an SA-6 upgrade replacing the legacy boosted ramjet 3M9 rounds with the SA-17 9M317E Grizzly round. An Iraqi 2K12 Kvadrat / SA-6B Gainful SAM system captured by US troops in 2003, in storage near Baghdad. Standard 3M9 CW SARH guided rounds are loaded (US DoD image). 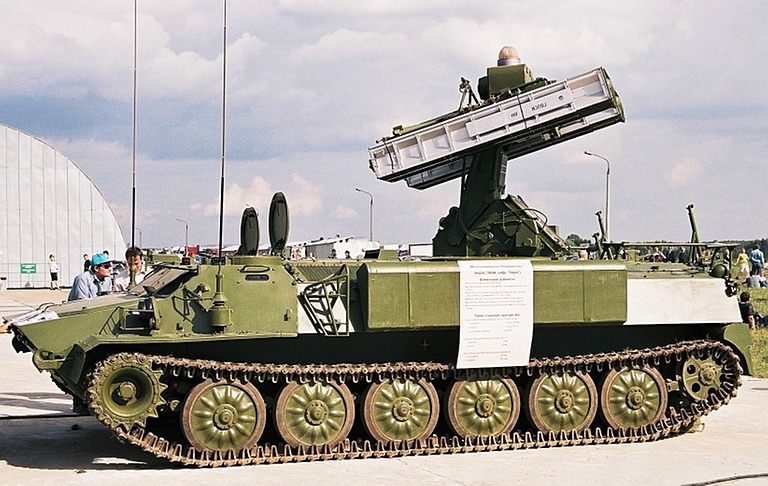 Perhaps one of the most interesting finds during the 2003 OIF invasion of Iraq were examples of the indigenous hybridisation of the 3M9 SAM round with the seeker section from the Molniya/Vympel R-60 / AA-8 Aphid heatseeking air to air missile, procured during the Cold War to arm Iraq's numerous Soviet supplied fighters. The motives for this development effort were clear - Coalition jamming of the CW seeker on the 3M9 missile round during Operation Northern/Southern Watch rendered the standard missile round ineffective. The intent was to produce an electronic countermeasures resistant variant of the missile with infrared terminal homing rather than CW semi-active radar homing. The basic 3M9/9M9 Gainful round is flown through its midcourse phase by command link from the 1S91 Straight Flush, using a tracking beacon in the tail of the missile. The most detailed public description of the design was produced by Doug Richardson, Editor of Janes Missiles and Rockets, in his April 23, 2003, article “Iraqi heat-seeking Gainfuls found”. Some imagery also emerged during that period. It would appear that Iraqi engineers stripped down R-60/60M rounds from remaining post 1991 warstocks to remove the OGS-60TI “Komar” / OGS-75 “Komar M” seeker section, which was installed in a re-engineered front section for the 3M9 fuselage, with a conical fairing and Aphid nose replacing the original guidance section containing the 1SB4 series CW SARH seeker. Adaptor hardware would be required to match the analogue pitch/yaw outputs from the R-60 seeker. The R-60 OGS-60TI “Komar”, and OGS-75 “Komar M” seekers, built by Arsenal in the Ukraine, are conventional single colour scanning detector designs with a cited ±12° off-boresight capability, ±17-20° in the later OGS-75 “Komar M” variant, and a 35°/sec tracking rate. The all aspect R-60M is credited with a 42 G capability. Overall the later model Komar M seeker compares closely to the US AIM-9L Sidewinder “all aspect” seeker. While the resulting heatseeking 3M9 round would retain similar susceptibility to flares or more recently, infrared jammers, the missile engagement sequence would be devoid of the CW illumination for the terminal phase of the missile's flight, as a result of which aircraft under attack only have the command uplink signals and terminal phase 1S91 tracking signals to warn of an approaching missile. Where the defensive countermeasures suite relies on the CW signal to trigger angle/range jamming, the heatseeking 3M9 could be potentially very effective. While multiple rounds were captured in Iraq, it is not known publicly how mature the design was or whether any attempt was made to use this weapon operationally. The design presents a good case study of how a nation even with a limited domestic technology base and under embargo was able to develop an asymmetric capability. More advanced infrared seekers retrofitted to any legacy or current production SAM design would present similar difficulties to the use of mixed seeker types in AAMs such as the R-27 / AA-10 Alamo, especially if these are countermeasures resistant two colour or imaging array designs. 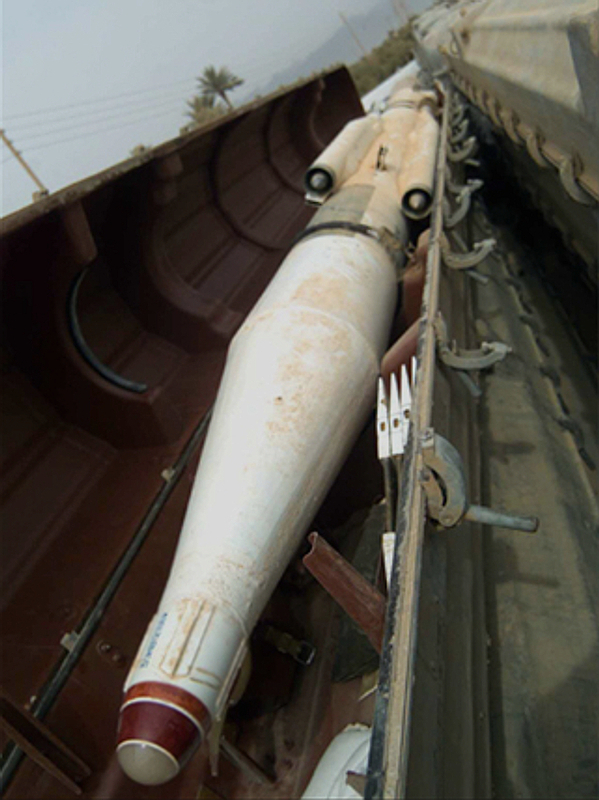 Captured Iraqi 3M9/R-60 hybrid heatseeking Gainful round. Note the Magnesium Fluoride nose window and ad hoc removal of the fixed nose strakes (US DoD image). Vympel/Molniya R-60 Aphid AAM (uncredited Russian internet image). 2P25 TEL with three 3M9 Gainful rounds loaded (Czech Army). 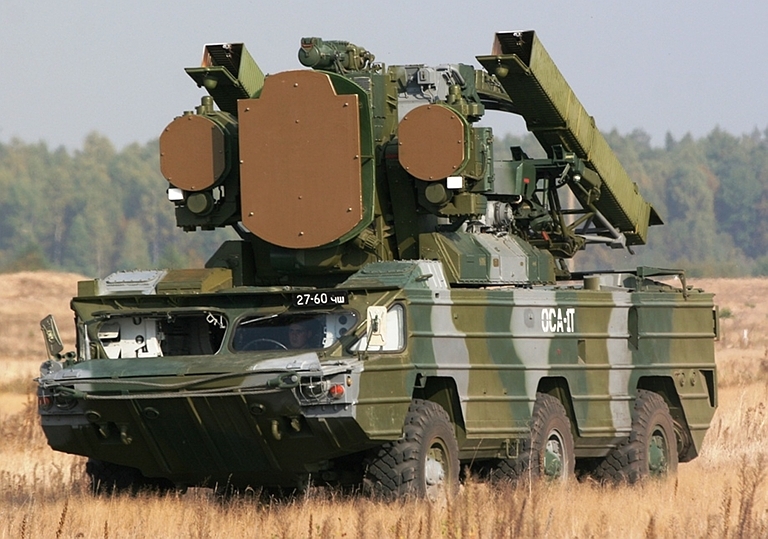 The modernised Kvadrat medium-range air defence missile system is designed to defend friendly troops and installations against modern high-speed manoeuvring strategic and tactical aircraft, as well as against attack helicopters and cruise missiles, under conditions of mass attack, in hostile electronic countermeasures and fire counteraction environment. introduction of testing and monitoring system providing real-time recording with subsequent playback of all data on operation of the ADMS major elements including radar, launcher and missiles. The ADMS is equipped with a BIT testing and measuring equipment set providing integral check-up of radar/launcher electronic equipment. A follow-on modernisation of the Kvadrat ADMS envisages considerable improvement of its combat capabilities by introducing some of the elements of the advanced Buk M1-2 / SA-17 Grizzly medium-range ADMS. 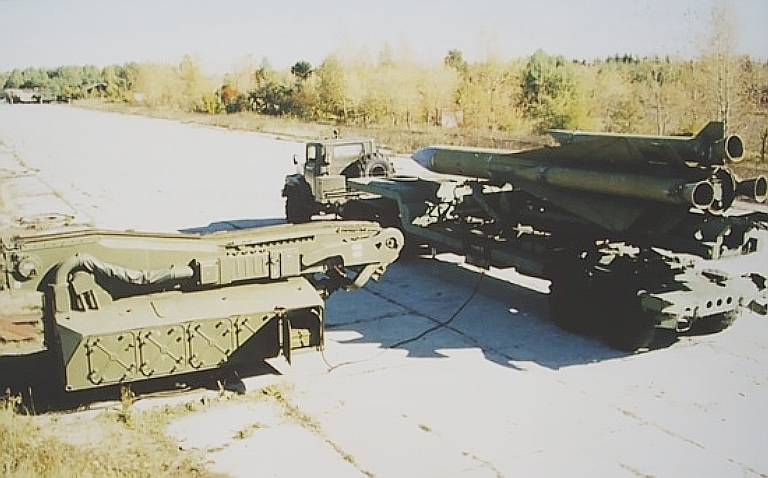 The second stage NIIP upgrade involves replacement of the legacy 2P25 TELs with the 9А310-М1-2 TELAR from the late model 9K37M1-2 Buk M1-2 / SA-11 Gadfly system and the 3M9 series SAM with the 9М317 / SA-17 Grizzly SAM (upper image © Miroslav Gyűrösi, lower image Olli-Jukka Paloneva via Wikipedia). Tikhomirov NIIP, the original designers of the 2K12 / SA-6 system, are offering a two stage technology insertion upgrade to the baseline design. Replacement of the CW illuminator to increase the number of alternate frequencies from 6 to 12, and to improve jam resistance and reliability. Replacement of the legacy analogue MTI system with a DMTI to improve clutter rejection and jam resistance. Add a Non-Cooperative Target Recognition (NCTR) capability against fixed wing, rotary wing and missile targets. Replacement of the thermionic receiver chain with a fully solid state transistor design. Replacement of the legacy CRT displays with AMLCD panels. Replacement of the analogue fire control computer with a digital processor. Addition of a modern digital wireless network connecting battery components and providing access to external data sources. 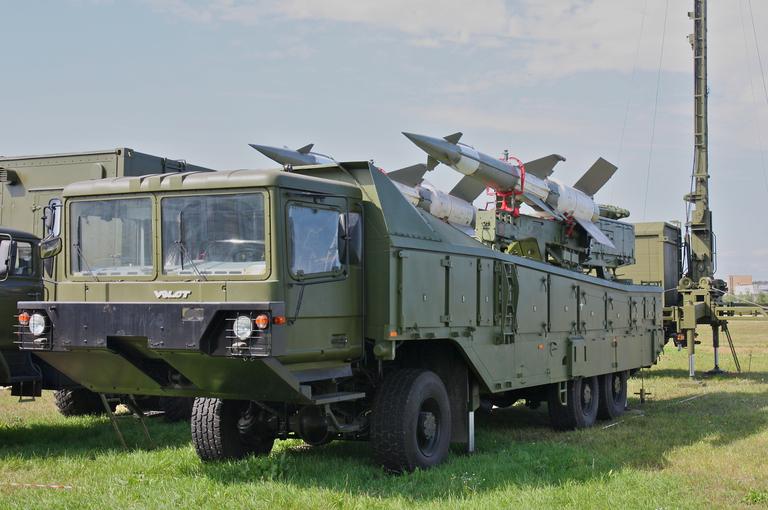 The second stage upgrade involves the replacement of the 3M9 / SA-6 Gainful missiles and 2P25M1/M2 TELs with the 9А310-М1-2 TELAR from the late model 9K37M1-2 Buk M1-2 / SA-11 Gadfly system and the 3M9 series SAM with the 9М317 / SA-17 Grizzly SAM. Основные тактико-технические характеристики ЗРК "Квадрат" с СОУ ЗРК "БУК-М1-2"
Hungarian Army 1S91 Straight Flush. A Polish built WZU-2 day/night optical tracker has been retrofitted on the RHS of the illuminator antenna (image © Miroslav Gyűrösi). Hungarian Army 1S91 Straight Flush. 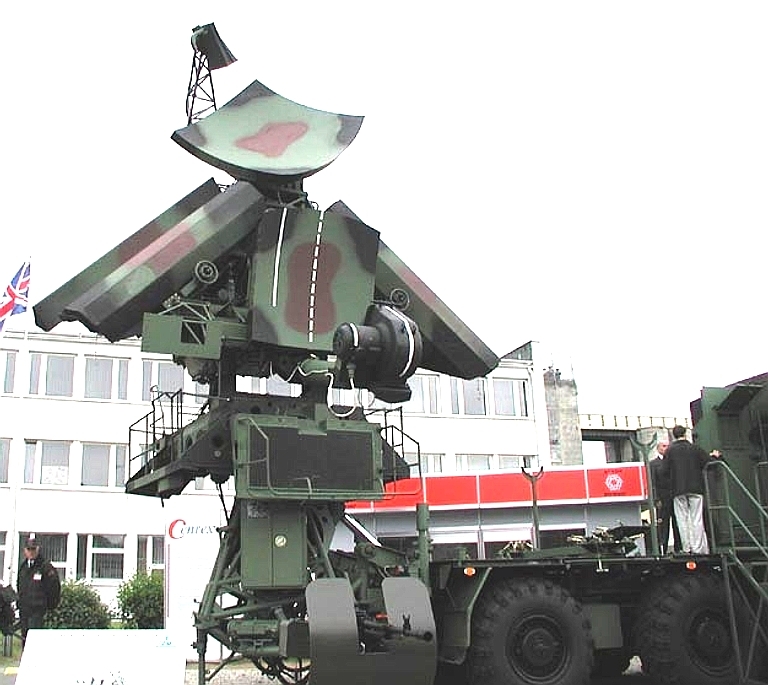 Note the stacked feeds on the search radar (image © Miroslav Gyűrösi). Hungarian Army 1S91 Straight Flush illuminator and optical tracker (image © Miroslav Gyűrösi). Hungarian Army 1S91 Straight Flush operator stations. 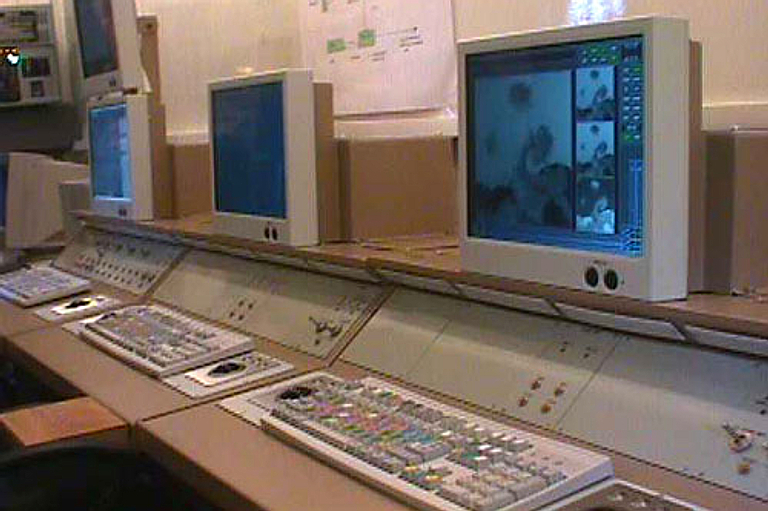 Note the retrofitted digital flat panel displays provided by Hungarian contractor Arzenal (image © Miroslav Gyűrösi). The Czech Army has performed a comprehensive rebuild of their 1S91 Straight Flush radars under the SURN CZ effort. The replacement RF stages are all fully solid state and the operating frequencies have been changed. All systems are fully digital, and the crew complement is reduced to an operator, a commander and a driver. SURN CZ Czech Army Straight Flush driver consoles (image © Miroslav Gyűrösi). SURN CZ Czech Army Straight Flush commander and operator consoles (image © Miroslav Gyűrösi). The 9K33 Osa/Romb / SA-8 Gecko was developed as a Soviet equivalent to the Franco-German Roland SAM series. It was intended to provide point defence for Soviet armoured and all arms divisions, and was hosted on an amphibious BAZ-5937 vehicle to maximise cross-country mobility. The Gecko was widely exported, Russian sources putting the number of clients at 20 nations. While the Gecko was limited in range and altitude performance, it was and remains very popular as the design is completely autonomous and highly mobile, making it ideal for setting ambushes against low flying fixed and rotary wing aircraft. In Soviet service it was primarily replaced by the Tor M / SA-15 Gauntlet which was better suited to rapid reaction fire against tank-killing helicopters. Given the large operator base, the Gecko is an attractive target for upgrades. JSC Kupol in Russia offer the Osa AKM upgrade, and Tetraedr in Belarus the Osa 1T upgrade. Agat have also proposed the miniaturised 9B-1103M-150 active radar homing seeker as a retrofit for the 9K33M3 / SA-8B Gecko missile round. The intent is to provide a salvoed fire-and-forget capability against multiple targets, supplanting the CLOS command link guidance, and better jam resistance for the weapon system. Osa AKM - an upgraded SA-8B Gecko (JSC Kupol images). 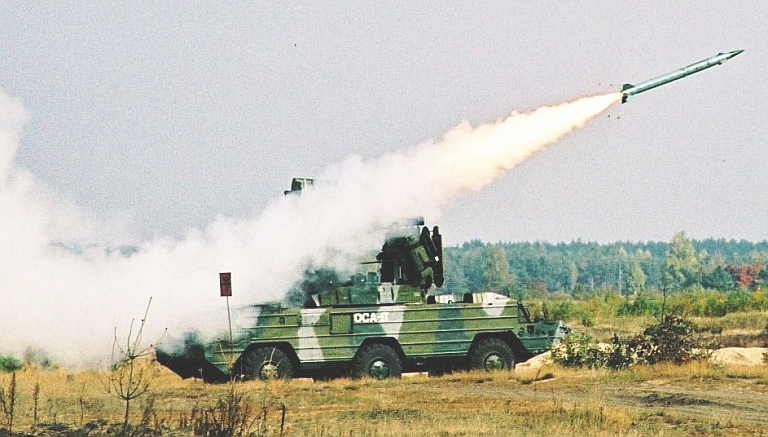 The Osa-AKM air defence missile system is designed to protect ground troops in all kinds of combat operations, as well as installations from attacks of aircraft, helicopters, cruise missiles and unmanned aerial vehicles. Osa-AKM is an autonomous self-propelled all-weather short-range ADMS. Each combat vehicle mounts radar, optical and computer systems, launching units with missiles, and power supply unit on the amphibious chassis. Their integration assures autonomous operation, including missile launches while on the move (one-two missiles against one target from a short halt). A group of combat vehicles can be controlled by means of existing control posts such as PU-12M7 and PPRU-M1. up to six 9M33M3 (9M33M1) SAMs in the transporter-launcher containers on each TELAR. autonomous simulator for TELAR operators. The Osa-AKM ADMS can be transported by any types of transportation means. improvements of the crew's habitability conditions. After minimal upgrading of the missile and combat vehicle equipment they can be used as the Saman aerial target system. Tetraedr have developed the Osa-1T upgrade package for the SA-8 Gecko, exploiting earlier upgrade technology developed for the command link guided SA-3. The upgrade includes digitisation of the legacy analogue Land Roll components, new control laws to improve kinematic performance. Tetraedr's Osa 1T upgrade recently underwent a redesign, to replace the legacy BAZ-5937 TELAR with a lightened derivative of the new ByeloRussian MZKT-69222, previously used in the latest Tor M-2/M2E / SA-15 Gauntlet variant. More affordable to operate and offering better mobility than the legacy BAZ, the new MZKT-69222 based Gecko TELAR is redesignated the 9A6922-1T. As of the end of 2008 Tetraedr had three contracts for the Osa 1T upgrade, one involving retention of the legacy TELAR chassis, and two involving rehosting the system to the MZKT-6922, with the total quantity at 80 TELAR rebuilds. The Osa 1T upgrade includes a revised crew station design and a new electro-optical targeting subsystem. 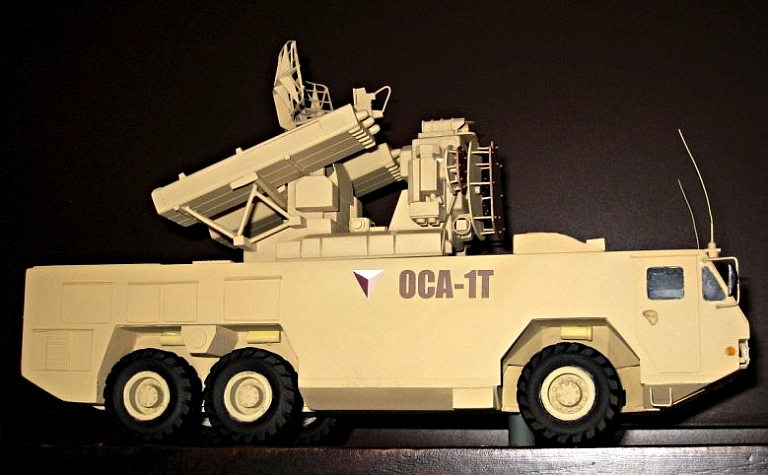 The "OSA-1T" ADMS is intended for fighting contemporary and future aerial attack assets under complex jamming conditions. The "OSA-1T" ADMS enables efficient defeat of low-altitude and small-size targets under all types of jamming. Enhanced combat capabilities of the ADMS: The "OSA-1T" ADMS owing to its innovative effective SAM guidance system, is capable of killing manned and unmanned air attack assets at ranges of up to 12 km and altitudes of up to 7 km, flying at velocities of up to 700 m/s. Combat operation automation: To automate the solution of the task related to the computation of kill zones of the target tracked in the real time and to reduce the system's response time every combat vehicle of the "OSA-1T" is equipped with a combat crew commander's automated workstation. 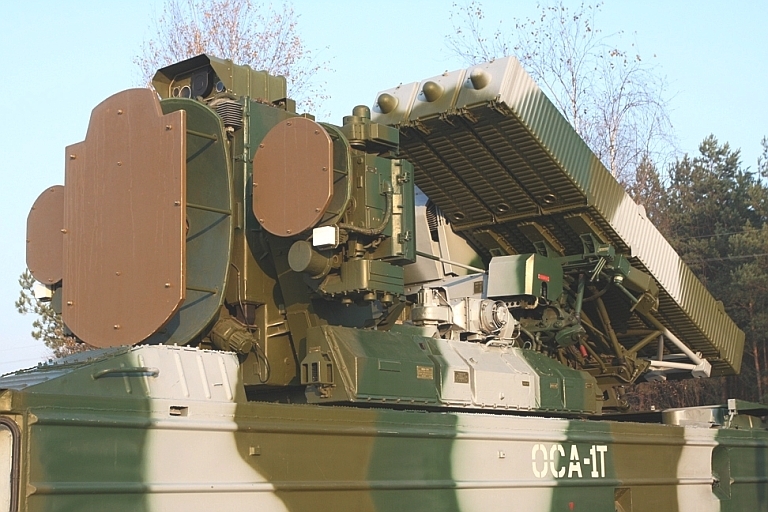 Enhanced ADMS reliability: 55% of the "OSA-1T" ADMS instrumentation has been converted to new hardware elements as against the base-line "OSA-AKM". The ADMS equipment reliability and service life have been increased; technical maintenance time and spare parts' nomenclature have been reduced. 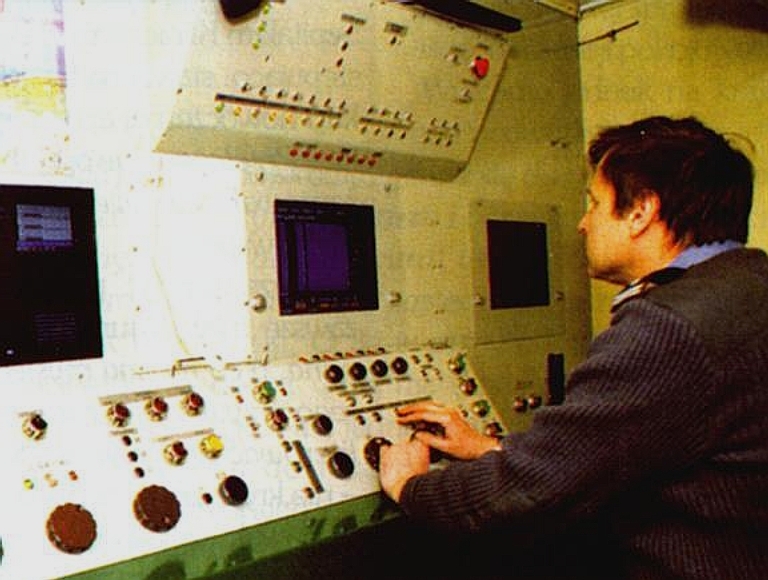 Training simulator 9F632, installed on a type ZIL-131 automobile chassis, has been completely discarded from the composition of the "OSA-1T" ADMS. Its functions are carried out by the training simulator, made as an independent unit and installed in every combat vehicle of the system. Modernised Osa 1T rehosted on the new MZKT-69222 6 x 6 chassis (images © Miroslav Gyűrösi). Modernised Osa 1T launch, hosted on legacy BAZ-5937 (image © Miroslav Gyűrösi). 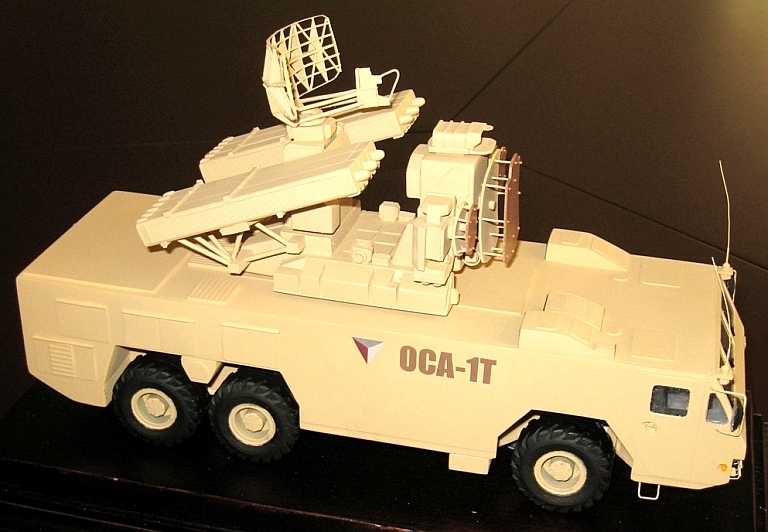 Osa 1T updated Land Roll radar package (image © Miroslav Gyűrösi). Osa 1T crew station (image © Miroslav Gyűrösi). 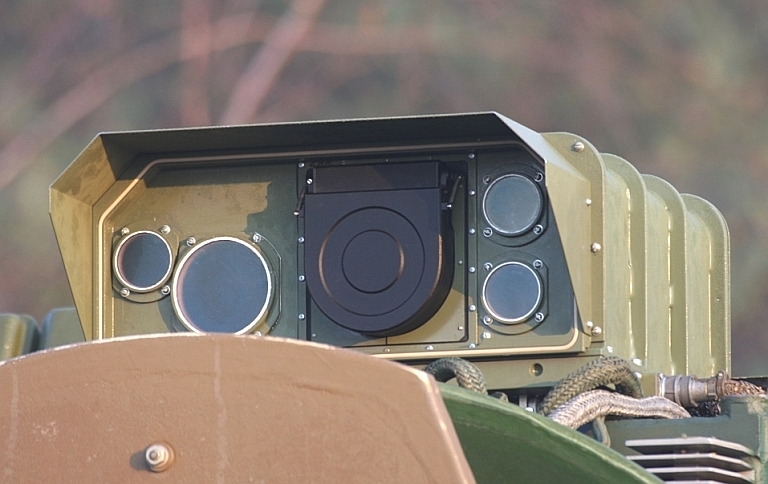 Osa 1T electro-optical targeting system (image © Miroslav Gyűrösi). Osa 1T during live firing trials at the Domanovo range in October, 2005 (images © Miroslav Gyűrösi). Tetraedr Osa 1T legacy TELAR (Tetraedr image). 9A34A Gryuza TELAR. Note the L-136 MAK-F IR sensor above the Snap Shot radar (all 9A34A and MAK-F images © Miroslav Gyűrösi). 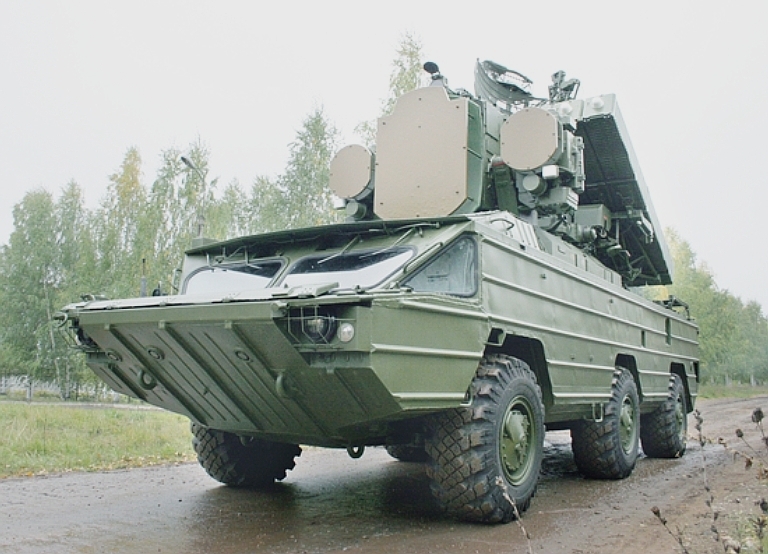 The capable heatseeking 9K35 Strela 10 / SA-13 Gopher SAM system is the successor to the widely used 9K31 Strela 1 / SA-9 Gaskin. 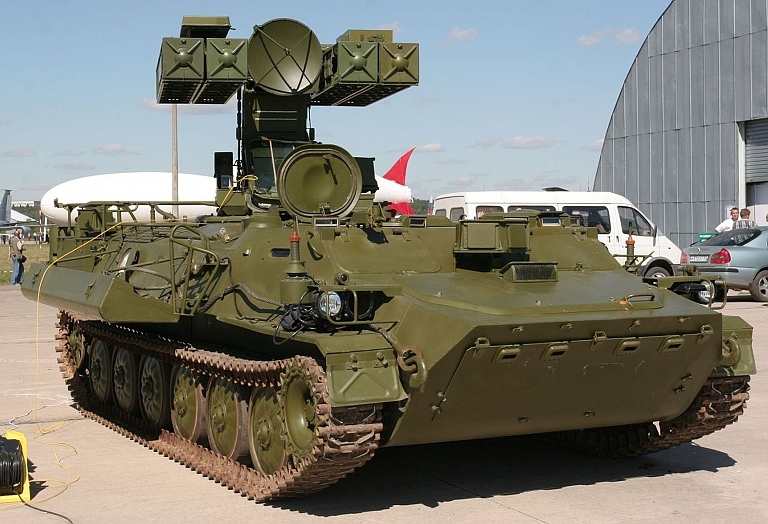 While not as widely exported as the SA-9, two upgrades are available for this system, both offered by Rosoboronexport, in addition to new build systems from the manufacturer KBT, either on MT-LB TELARs or more recently, BTR-60PBM, BTR-70 or BTR-80 based TELARs. 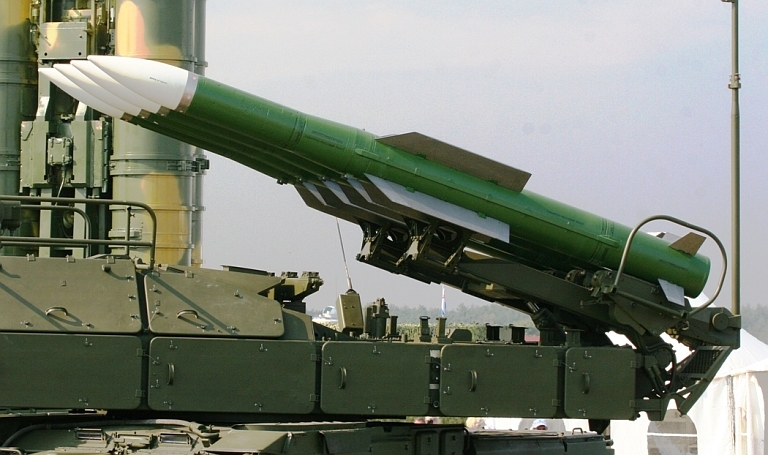 An upgraded 9M37MD missile round is on offer since 2005. 9A35M4 Strela 10M4 TELAR on MT-LB chassis. Note the open flotation chambers and new EO sensor package above the RHS launchers (image © Miroslav Gyűrösi). The Strela-10 short-range ADMS is designed to provide close air cover for ground forces in all types of combat operations and on the march, as well as to protect installations against low-altitude airborne threats, including fixed- and rotary-wing aircraft, cruise missiles, remotely piloted vehicles, under conditions of natural clutter and man-made optical (thermal) interferences by day and night, in restricted visibility conditions. There are two modernisation options of the Strela-10 mobile short-range self-contained ADMS, namely: [KBtochmash] Strela-10M4 and Strela-10A (9A35A Gyurza). The upgraded systems can launch missiles from stationary positions, at short halts and on the move, both against approaching and receding targets. For its deployment in restricted visibility/night conditions, the system is fitted with a new night sight with thermal imager and/or LLLTV camera. Maintenance and training assets are common both for the basic and modernised ADMS. 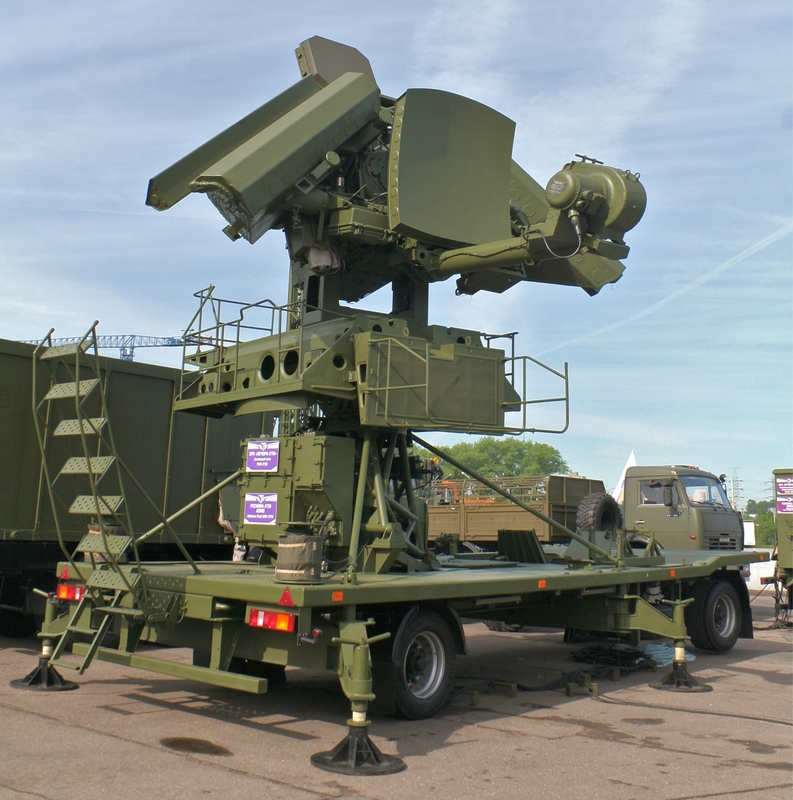 Strela 10M4 upgrade electro-optical tracking system with FLIR and LLLTV imagers, mounted above missile launch tube/container (Rosoboronexport). 9A35M4 Strela 10M4 TELAR (KBT image). 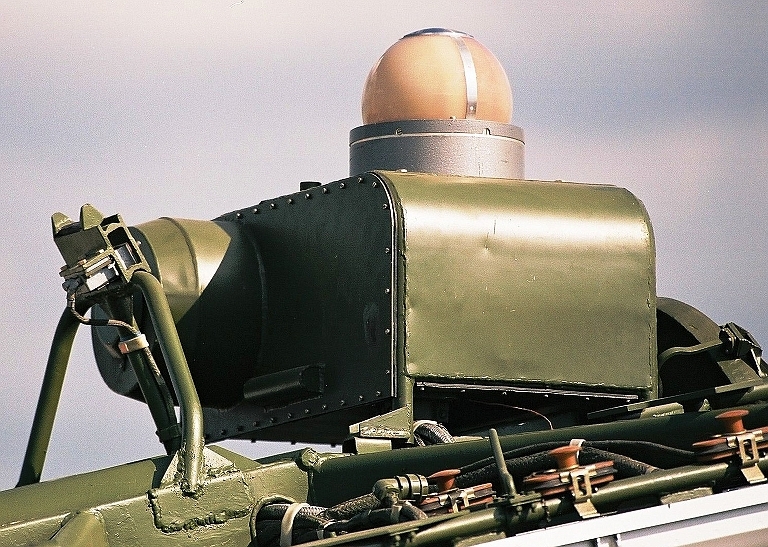 Azov L-136 MAK-F hemispherical infrared search / track sensor mounted on top of the TELAR missile launcher. 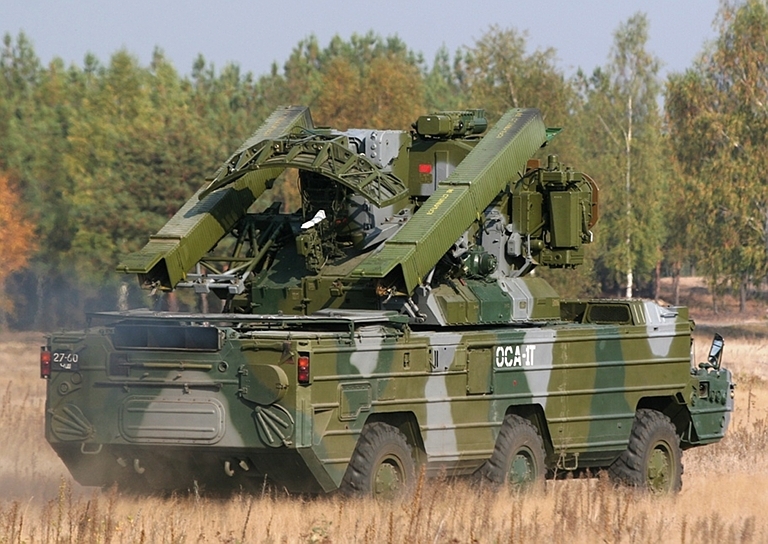 Modernised Gyurza is distinguished from the basic system by the combat vehicle outfitted with all-round Azov L-136 MAK-F IR detection/acquisition system with digital computer, control and display panel. The Gyurza ADMS is operational round-the-clock, including nighttime. centralised operation when remotely controlled from the command post. Basic combat performance data and maintenance assets are identical to those of Strela-10M4 AMDS. Ventral MAK-UL IR sensor on Tu-95MS Bear H. This family of devices provide staring hemispherical IR coverage and have been used both as MAWS and aircraft threat warning systems in airborne applications, especially for bomber aircraft. The MAK-F variant employs an infrared transparent hemispherical window. Relative placement of L-136 MAK-F sensor and Snap Shot antenna. Note the left upper strut with the waveguide feed to the antenna horn. Detail of L-136 sensor head and electronics enclosure. 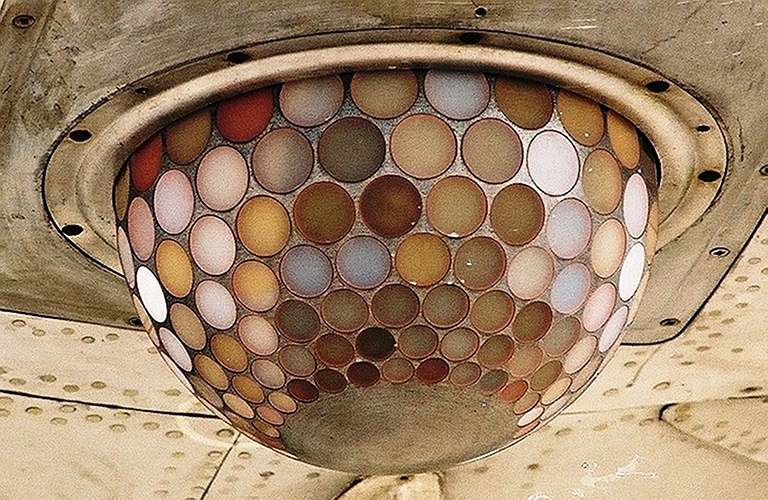 Above, below, detail of L-136 installation and mounting. The upgraded ZSU-23-4M4 incorporates a range of electronics upgrades as well as four MANPADS launchers. The ZSU-23-4 Shilka self-propelled antiaircraft gun system is designed to provide air defence of land forces in all kinds of combat operations, as well as that of installations. 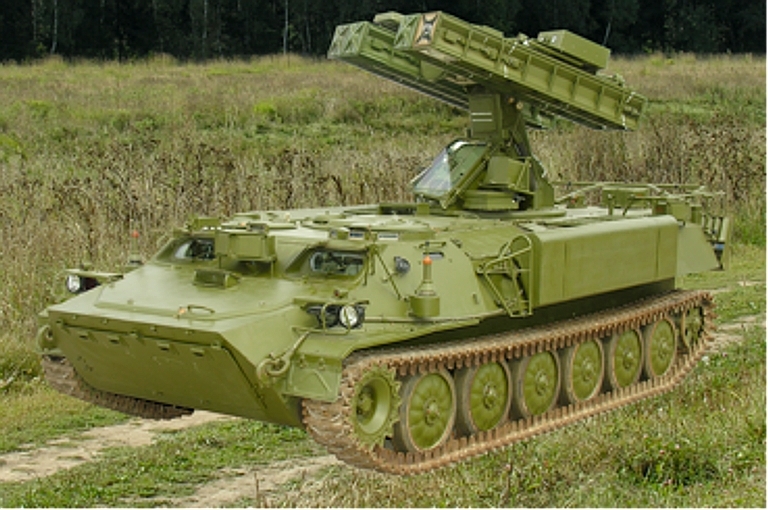 The ZSU-23-4 SPAAG system can detect and engage fixed-and rotary-wing aircraft (including hovering helicopters) and other low-altitude air targets from stationary position, short halts or on the move, as well as ground/surface targets. 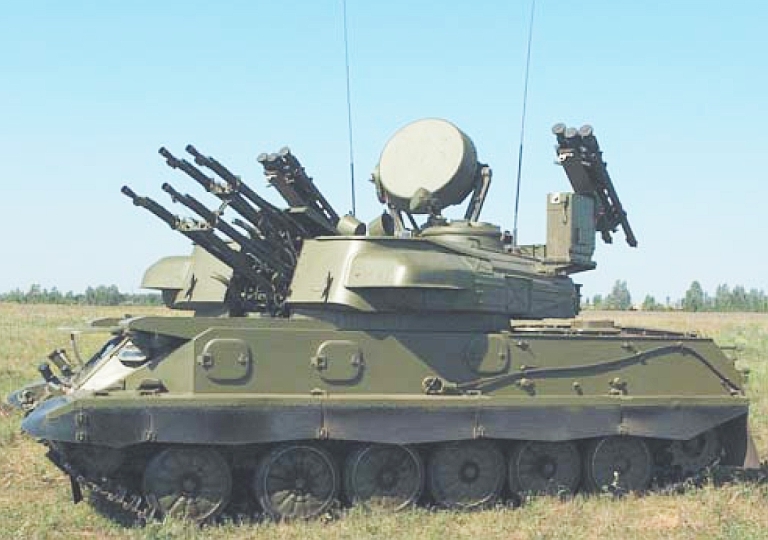 Profound modernisation of the vintage ZSU-23-4 Shilka systems is proposed as ZSU23-4M4. Hit probability (with up to 300 rounds allowance) of the upgraded Shilka against one air target passing through its engagement envelope is increased by 0.6 approaching that of a close-range ADMS. introduction of self-defence system elements: to protect the SPAAG system against high-precision weapons, to reduce its IR signature, as well as fitting it with an air conditioning system. 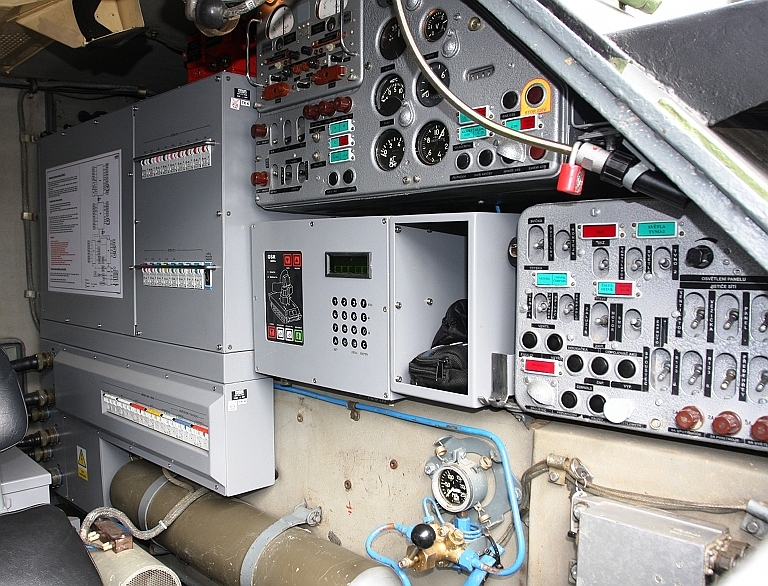 Modernisation of the SPAAG systems by introducing up-to-date microcircuitry and components providing digital data processing and exchange will ensure SPAAG system's repairs and supply of spare parts, tools and accessories for another 10 – 12 years. The Shilka modernisation programme is aimed at improving control, operational and life support capabilities. It includes upgrading of tracked chassis and primary power supply system. An economical diesel-electric power unit improves combat control and crew’s working conditions. 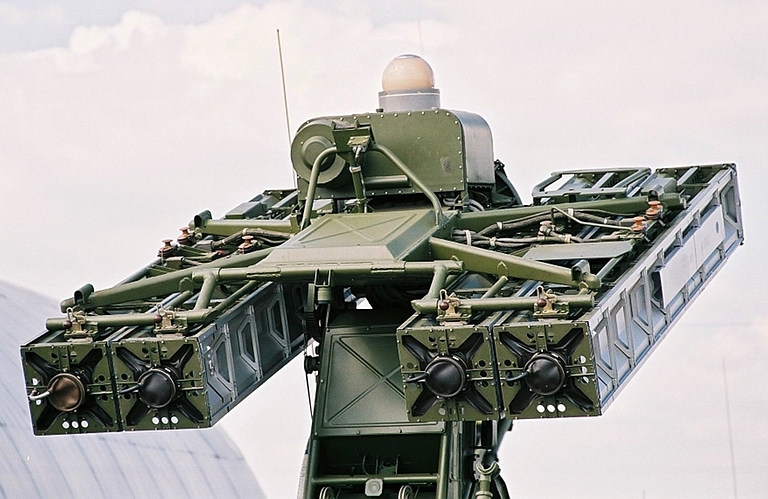 At customer request, the SPAAG system can mount a set of control equipment with two Strelets-23 launch modules, designed to carry and launch four Igla-type missiles, as well as an IFF transponder complying with customer's existing standards.